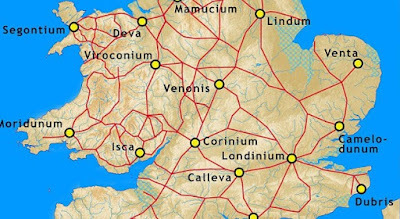 A blog concerning ancient sites, their alignments & geometry. 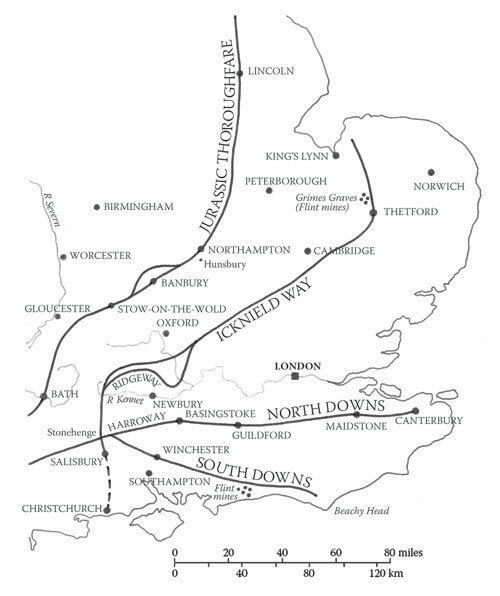 Featuring The St Michael - Mary alignment, Avebury Henge, Silbury Hill, Windmill Hill,St. 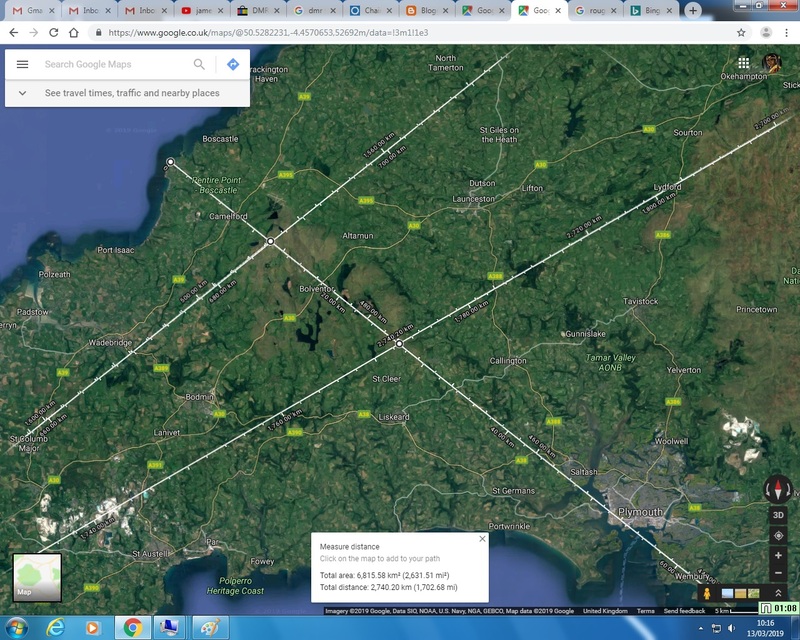 Michael's Mount, Glastonbury, Penwith ancient sites, Apollo - Athena line etc. I have written much in my previous posts about the St. Michael/Mary alignment (https://ancientwhisperspenwith.blogspot.com/2019/01/the-st-michaelmary-alignment-my.html) which runs across the UK mainland from Carn Lês Boel (pron. 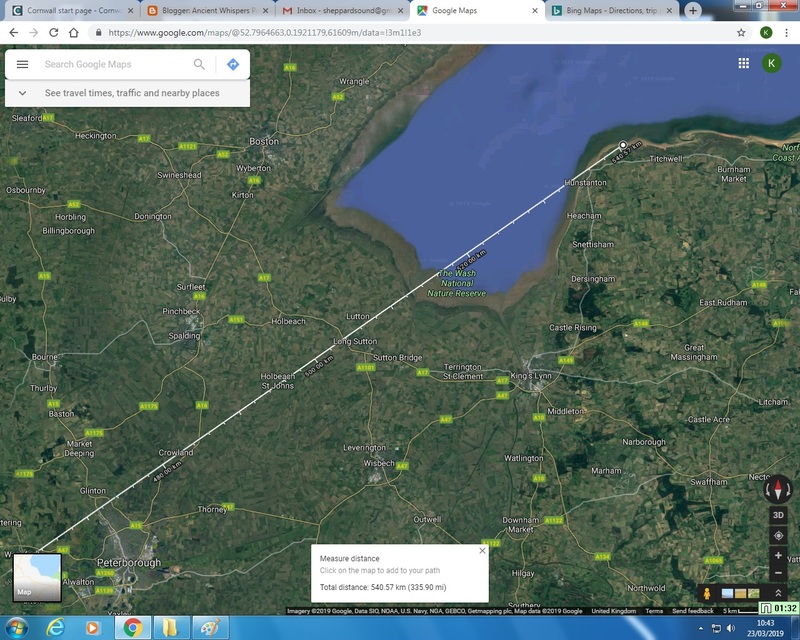 "karn leez boel") to Hopton near Great Yarmouth on the Norfolk (eastern UK) coast. 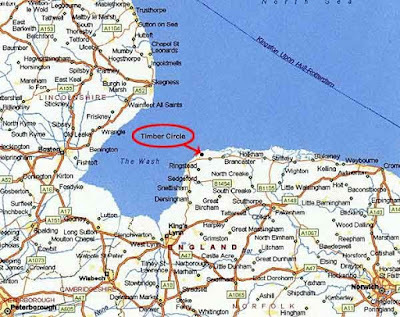 This post concerns another major alignment that also emerges from the sea at Carn Lês Boel but runs at around 50 degrees (summer solstice sunrise - general) up the country to Holme-next-the-Sea on the lower lip of The Wash on the East-Anglian coast where the county of Norfolk meets Lincolnshire. This was the site of two early bronze-age timber circle structures exposed by the receding silt known as "Seahenge" - named so by the press on discovery in the nineties. It is oriented from the direction of the winter solstice sunset & the summer solstice sunrise & of course runs through many ancient sites, this particular line seems to align quite a few Cornish "Rounds" as we will see. 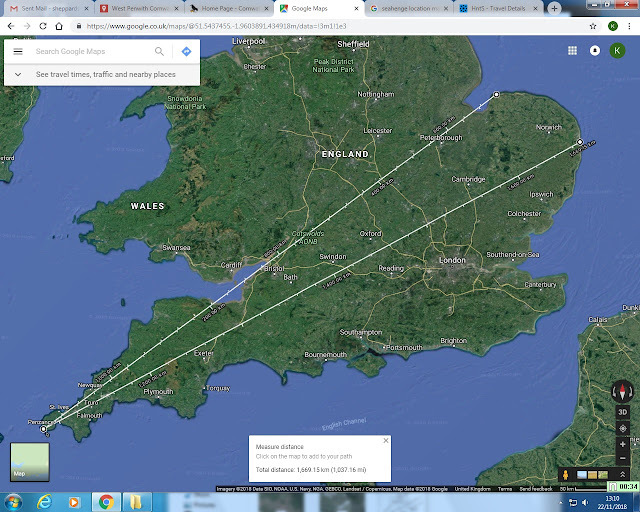 Also, after both crossing the Tintagel - Jersey alignment either side of Bodmin Moor, the CLB - Seahenge line also runs through Exmoor while the St Michael/Mary line heads for Dartmoor. 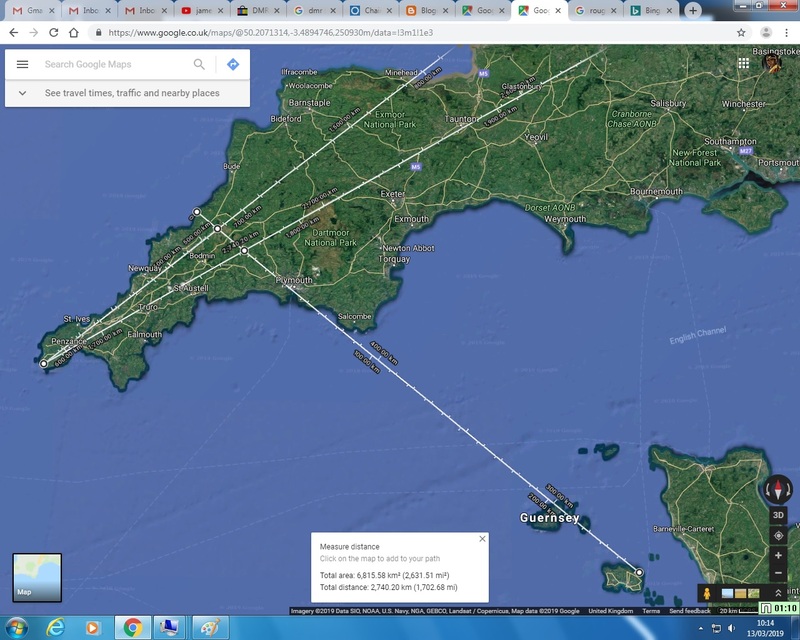 Some of the features are no longer there but I will provide a link to a map (amongst others) of the alignments of ancient sites & ancient features still remaining & no longer there of Penwith, Cornwall. 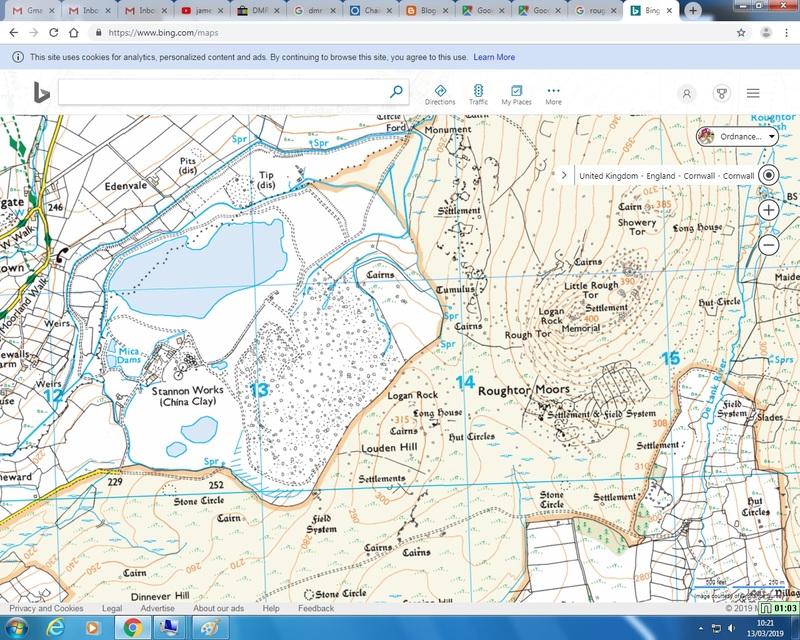 At first glance the alignments map can seem overwhelming, this is because the lines & icons remain the same size as you zoom out, Just zoom in with your mouse wheel/pad & it will start to make sense. 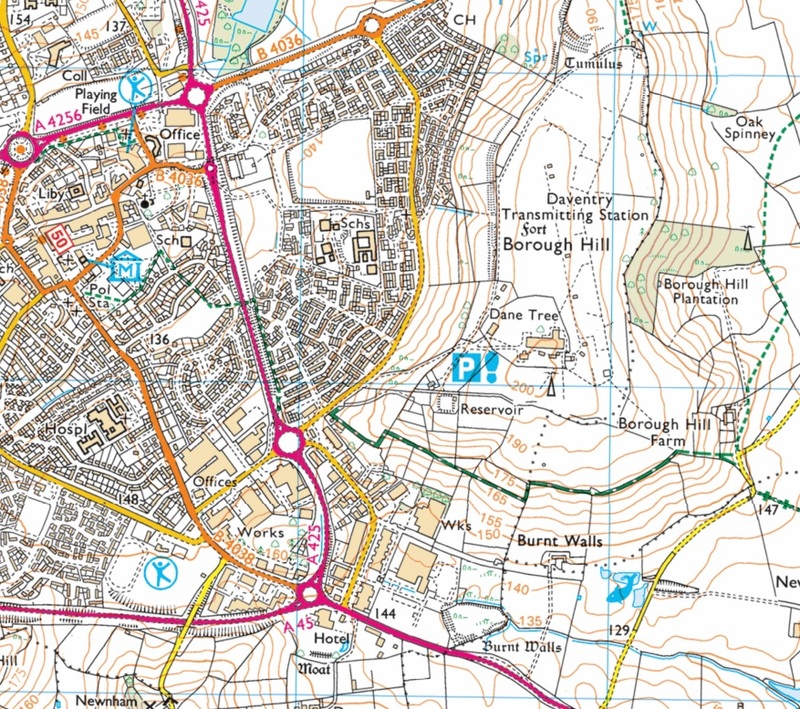 A map of the same Penwith sites but without the lines is also available on this site. 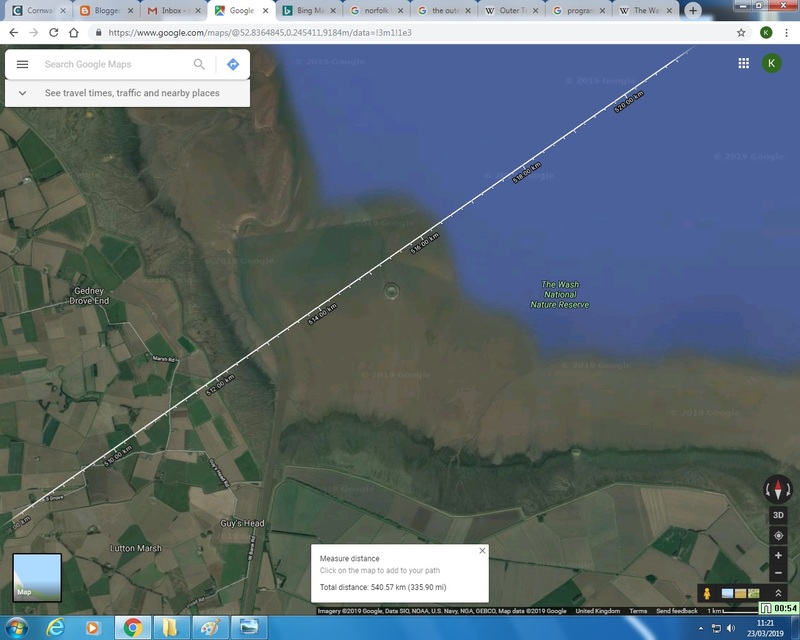 I have had this line running in this position, from Carn Lês Boel to the lower lip of The Wash in Norfolk/Lincolnshire (see satellite image above) for quite some years but it was only relatively recently that I stumbled upon the fact that this was the site of two early bronze-age timber circles known as "Seahenge"(see map below). I remembered the reportings on this site as first one, then the other circle was discovered but didn't know a great deal about them. I remember the controversy over the removal, dating & preservation of the timbers & am a little frustrated by the fact that all the effort seems to have gone into preserving the actual timbers rather than recording the position of the two circles - very important for the alignment chaser!. Of course their positions have been recorded but I have almost given up trying to obtain a map or plan of the two circles in situ. despite contacting many museums, as I would like to see how their placement & dimensions relate to each other with possible edge alignments etc. 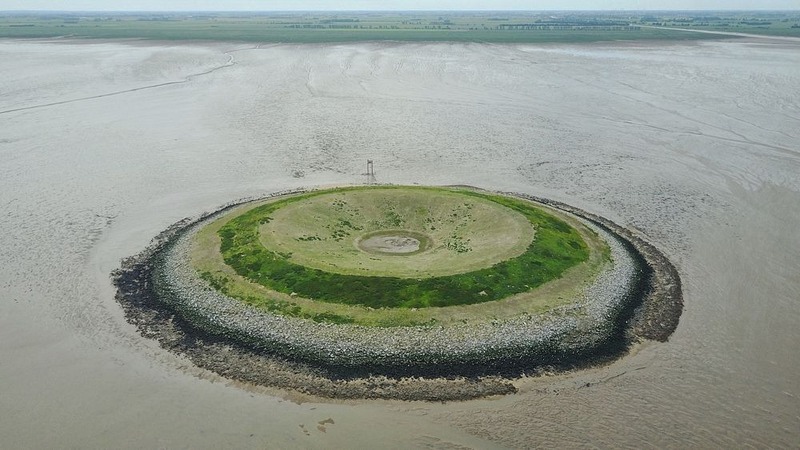 The second circle ("Holme II") was discovered 100 meters (328 ft.) to the east of the first ("Holme I"). The location of the north-east limit of our line is also the point where a series of ancient track-ways that span the country (including; the Ridgeway, the Iknield Way & the Peddars Way) meets the North Sea. 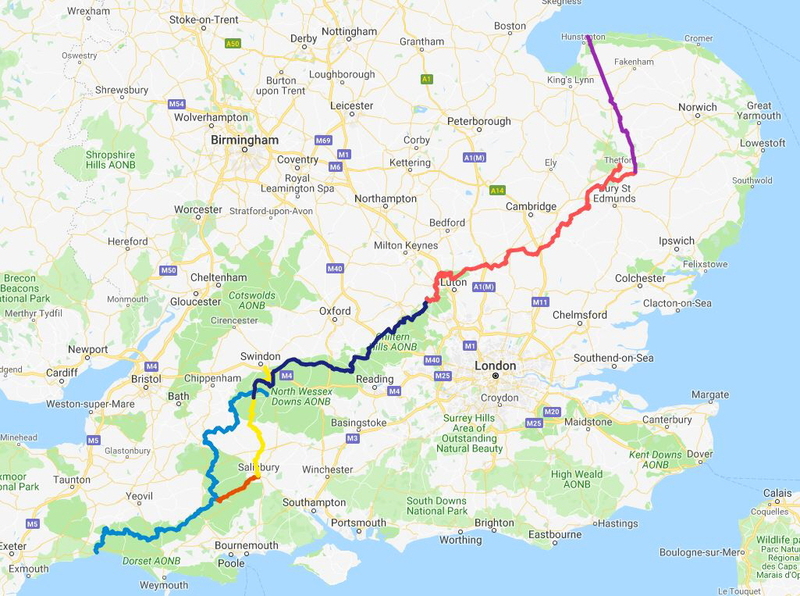 This route ranged from the Dorset to the Norfolk coasts, following the chalk escarpment that includes the Chiltern Hills & Berkshire Downs etc. before ending up at the site of "Seahenge" (see map below). Carn Lês Boel, as we have discussed in previous posts, is a dramatic, rocky promontory that has the remains of an iron-age fort, but there are older features such as standing stones, barrows etc. 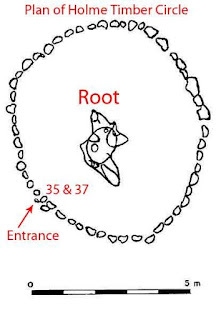 This arch is more of a slot type than an arch so is very directional. It seems to be most open at 230 degrees which is 50 degrees west of south & towards the geometric direction of the winter solstice sun-set. This is in line or parallel with our alignment in this study. If this sounds fanciful or irrelevant, a parallel will be drawn in my next post to lend it some more weight. 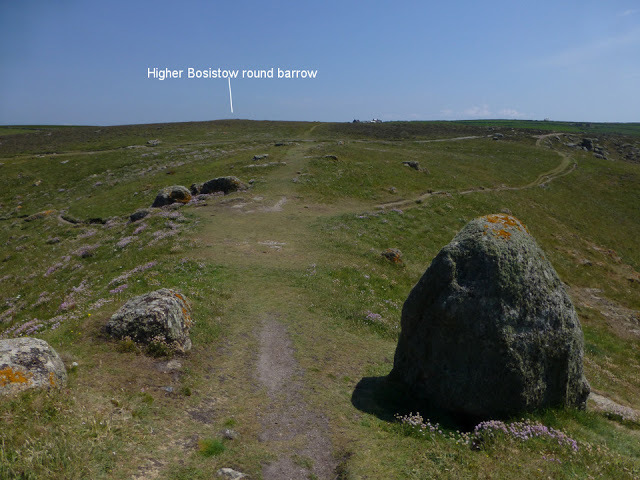 Back up on the promontory of Carn Lês Boel our line runs inland, between the same two standing stones that the St. Michael/Mary alignment passes through, then hits Bosistow barrow, almost destroyed by weather but just visible on the near skyline (see pic. 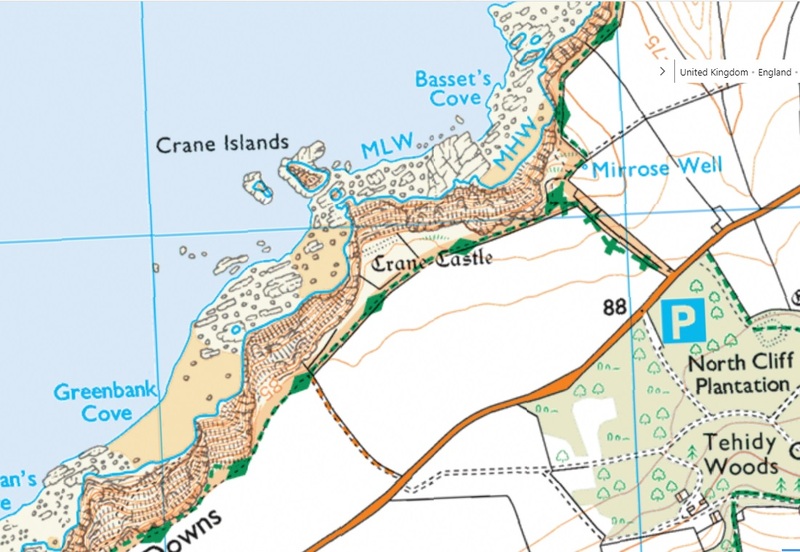 & map below). Only 4.27 miles (6.88 km) up the line we reach the impressive late neolithic - early bronze-age stone circle at Boscawen-ún ( Pron. 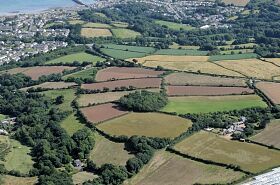 "Boskaa-noon" - Cornish; bos = dwelling, scawen = elder trees, un, noon, gun, woen etc. 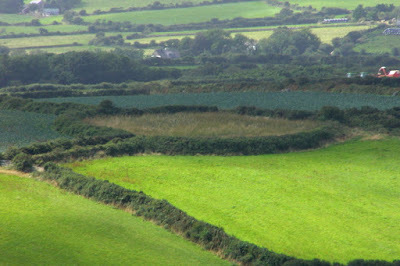 = downland) near St. Buryan. 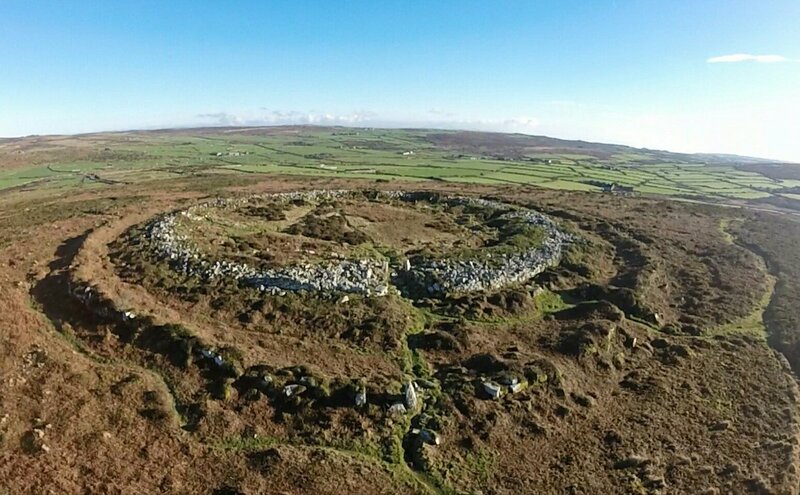 The circle comprises of nineteen flat surfaced or female stones, eighteen granite & one milky quartz/granite, surrounding a large, rather phallic off-central pillar which is propped at an angle pointing north-east. This probable indicator stone has a straight ridge running up it's back & is oriented towards an outlying hedge menhir. The central stone points towards the midsummer sunrise. 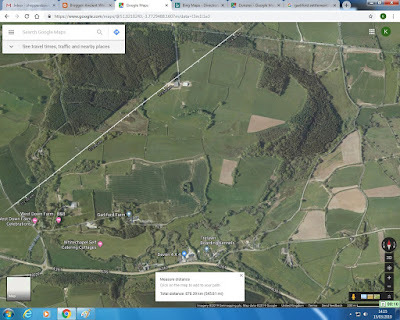 The whole stone, when viewed from the edge of the stone behind it, points 50 degrees which is right up our line ("coincidence" event!) but the prominent edge along the back of the central stone is aligned to 54 degrees which is more towards the local solstice direction. 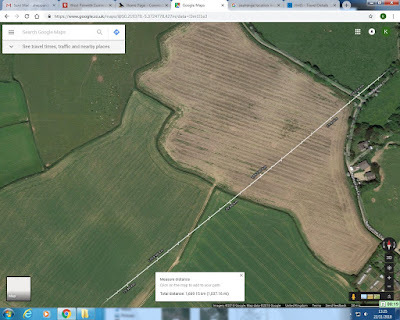 It points towards a pointed menhir incorporated into a wall a few fields away near the farm. 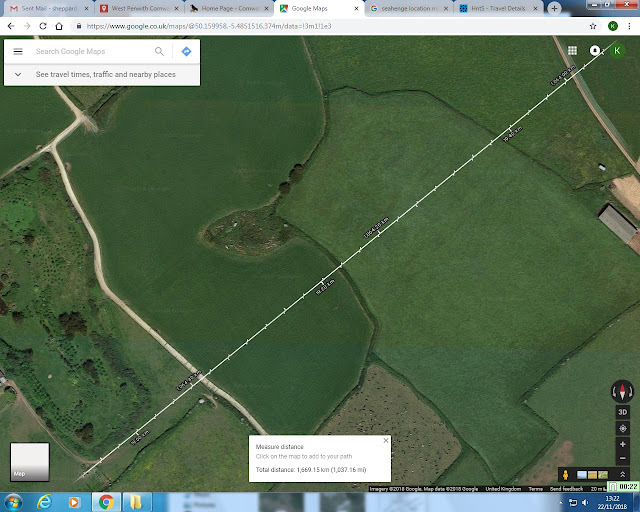 Our line doesn't pass through the centre of the circle or the central stone but hits a barrow next to the circle (edge alignment) before running through the hedge menhir near Boscawen-ún Farm. Less than a mile (3,282 meters) overland the line passes close to a large quartz studded granite slab (female) menhir known as the Blind fiddler, standing proudly in a field near the A30 road. On my visits I have always appreciated a very calm atmosphere around this stone as it stands 3.3 meters (10.8 ft.) high, sedate, yet proud. From there it's just another 2.20 miles (3.54 km) up-line to the tree-covered hilltop Cornish "Round" at Lesingey (or Lezingey). 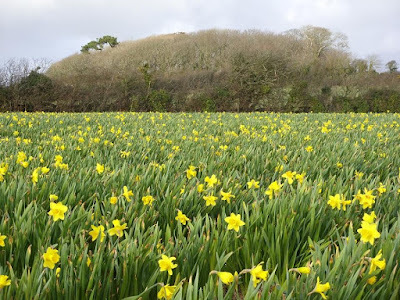 Rounds are most common in Cornwall they were once referred to by the pretty term "Round-a-go". 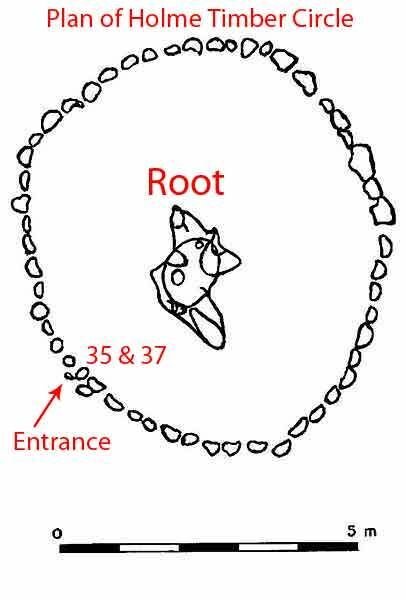 They are usually, but not always a hilltop feature consisting of a circular enclosed area with normally a singular entrance. They date variably from iron-age to medieval periods. Some were the sites of fortifications or settlement some were featureless. Some suggest observation or defence purposes, some suggest ritual. In later years, at least, they were used for sports competitions & the stages for (usually religious) plays. 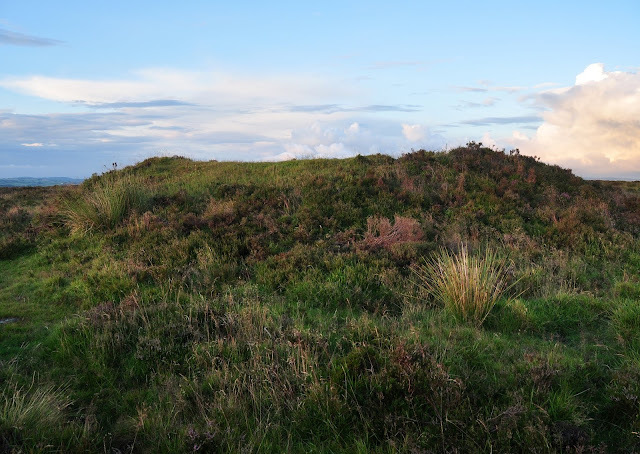 Lesingey Round is a "small univallate earthwork", probably iron-age, with a 12 - 15 foot (3.65 - 4.57m) rampart & ditch. It commands a 360 degree panoramic view (except for the trees!) with many ancient sites, hilltops & beacon spots visible all round, not least a spectacular view of St. Michael's Mount. It is also a good bluebell spot. The round may have been referred to by topographer John Norden in 1584 when he described a ruined castle on a hill over Penzance which he called Castle Horneck (Cornish; horneck = iron-like or impenetrable), suggesting occupation during medieval times. 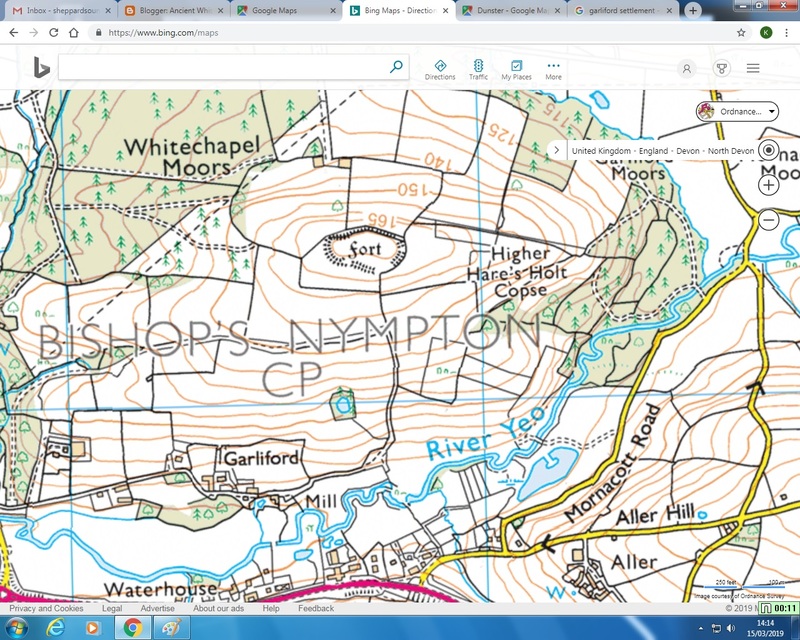 The area & a nearby manor house retain the name today. 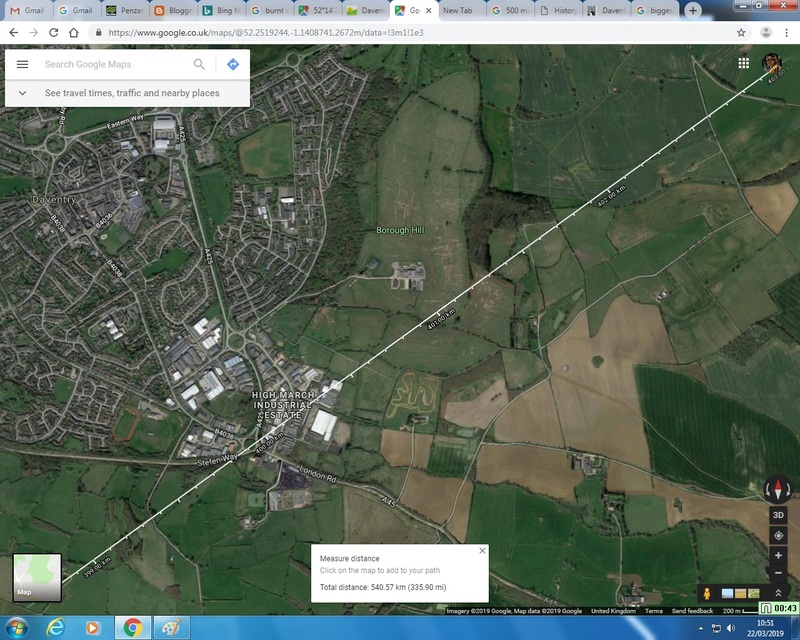 From my studies of this site (it is my local site) I have learned that it is the spot where two quite major alignments cross, our current study; the Carn Lês Boel - Seahenge line & a line that can be traced from Drombeg (or Drumbeg) stone circle in county Cork, Ireland which, from there then passes over the Irish Sea, across Penwith to Lizard Point, south-west Cornwall, UK. 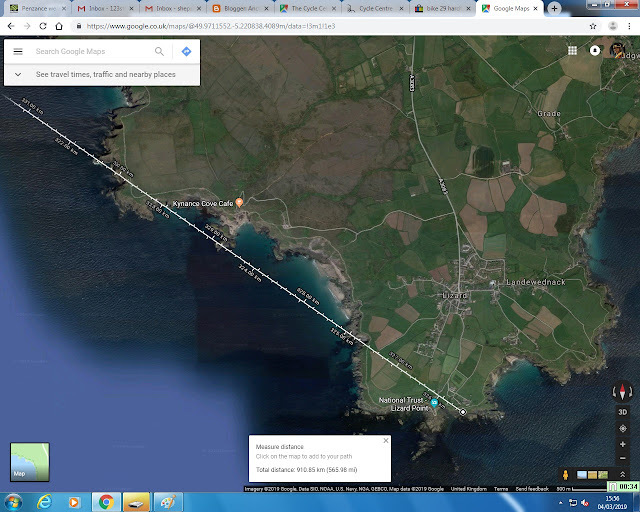 It is not a perfect cross as our current study line is close to 50 degrees (east of north) & the Drombeg - Lizard cross line is close to 216 degrees (54 degrees west of north). The first closer to a geometric solstice & the latter closer to a local solstice direction. 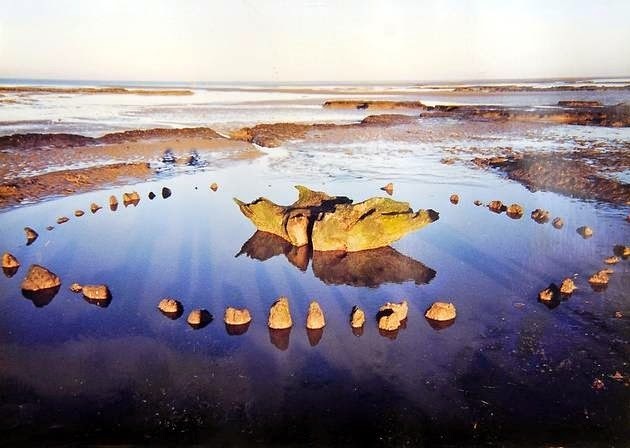 We will take a short brake from the CLB - Seahenge line to study this cross-alignment. From the direction of the summer solstice sunset to the winter solstice sunrise, the line runs through/from Drombeg stone circle, county Cork, Ireland. 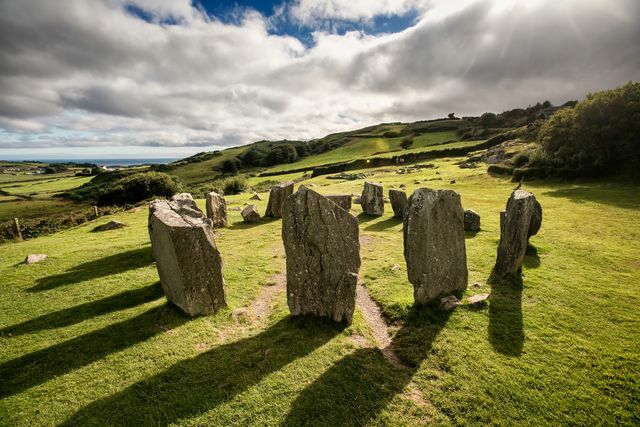 Drombeg stone circle probably dates from the late bronze to early iron-age. 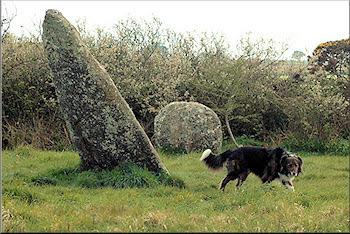 It consists of a small circle of 17 large stones of which 13 remain upright, one tall slender (male) stone was removed in the early nineteen hundreds by the land owner & moved to Drombeg House, this was thought to be the main shadow caster to be received by the flatter lozenge (female) stones. There is also a large recumbent stone within the circumference, oriented south-east towards a notch in the landscape horizon which may be towards the local winter solstice sunrise, although opinion is divided. The discovery of the cremated remains of an adolescent human in a purposely broken urn, bound with cloth, unearthed in the center of the circle couldn't have helped matters much, It does have evidence of an offering - broken pots, jewelry, weapons etc. have been found in devotional sites, but perhaps it also could have been a cherished youth who died being favorably offered to the underworld. 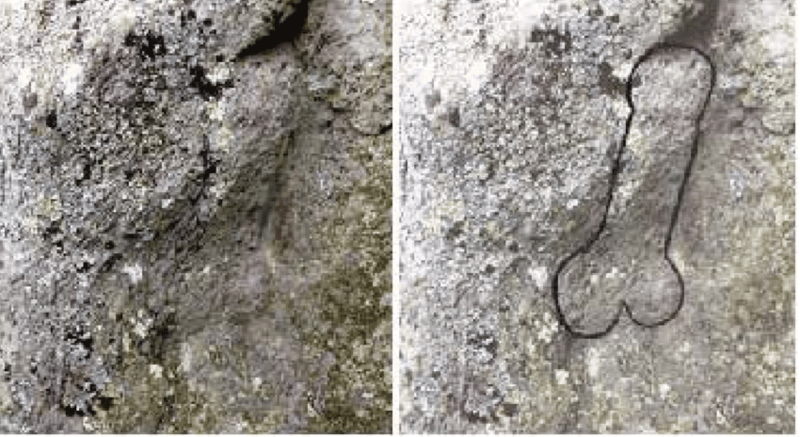 Some carvings have been identified at the site such as two cup-marks, one circled, on the recumbent stone also an axe or foot shape, which was very common in ancient times in Europe, & even an erect phallus on one of the tall stones - if unintentional then it is a pretty good example of a simulacrum that probably would not have passed the ancients by (see pic. below). 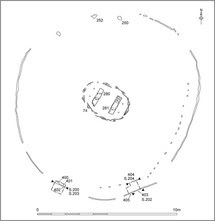 As can be seen in the satellite image above there are also the remains of two conjoined roundhouses close by, one of which had an oven. 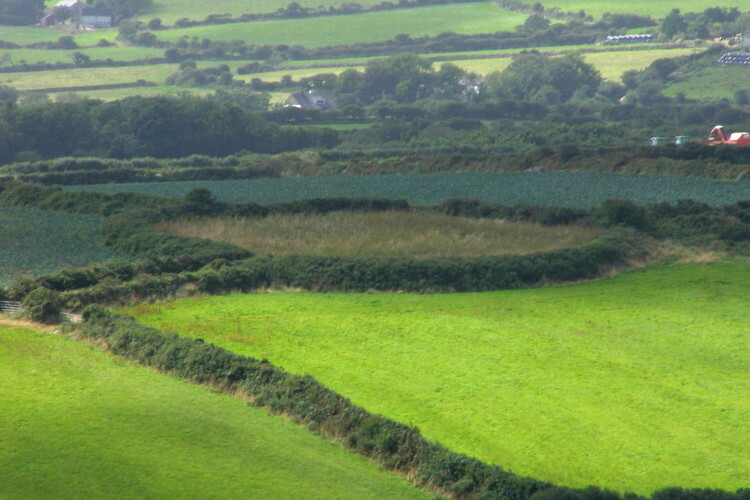 From there leads a causeway to another structure containing a well, an hearth & a trough known as a fulacht fiadh (Ir. 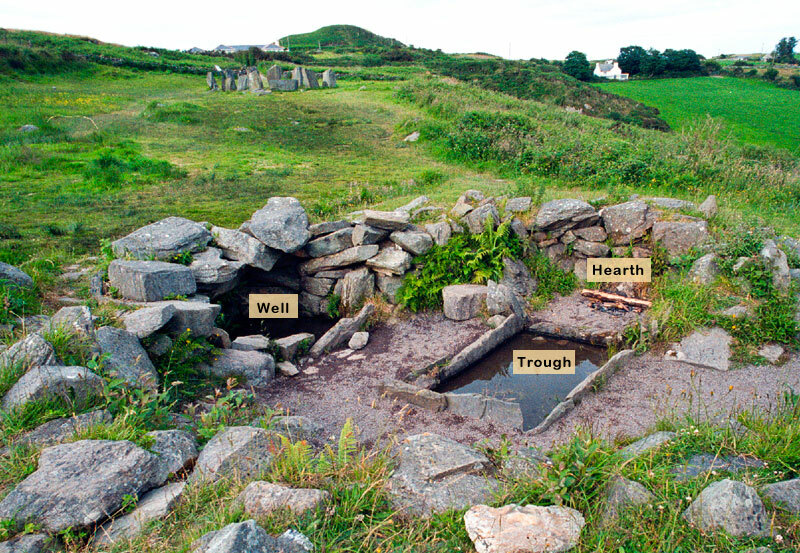 Gaelic; deer (or wild) cooking pit), common only in Ireland, which was used for boiling water for cooking by placing in hot stones (see pic. below). It is thought that these buildings were in use until around 500 AD. 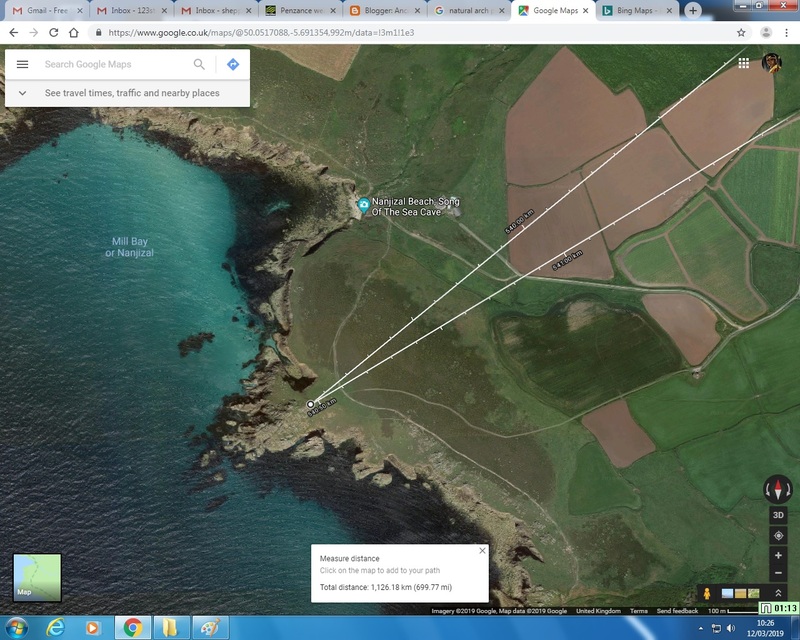 After a journey across the Irish Sea, the line hits the UK shore again at a promontory called Pendeen Watch, Penwith, Cornwall. 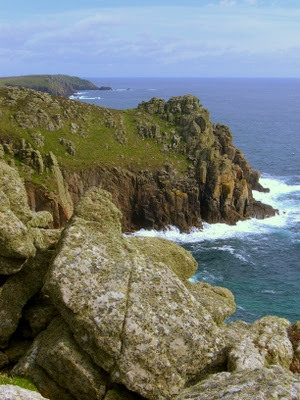 The name "Pendeen" translates from Cornish to "fortified headland" (Corn. 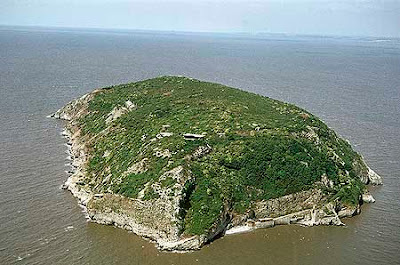 ; pen = head or end & dyn = fort) & it is the site of what has been described as a "cliff sanctuary" although it is destroyed with little trace. Chûn (pron. 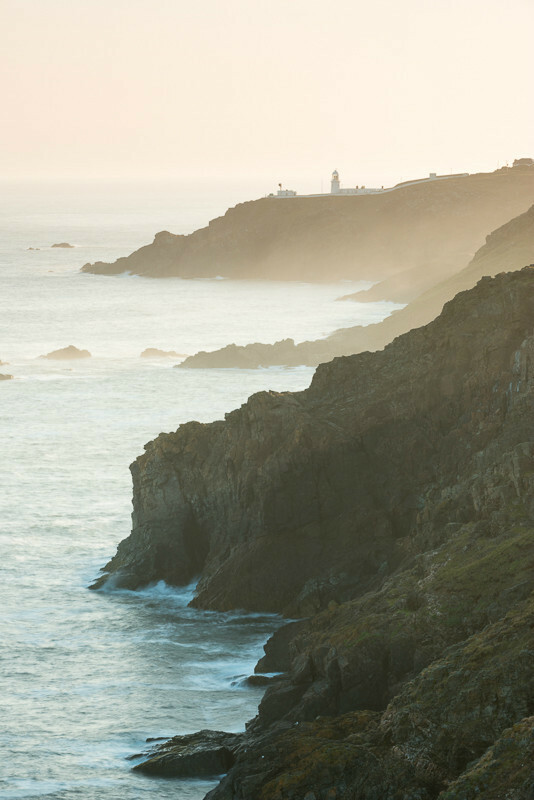 "choon" - Cornish; chy = house, & woon, gun, un etc. 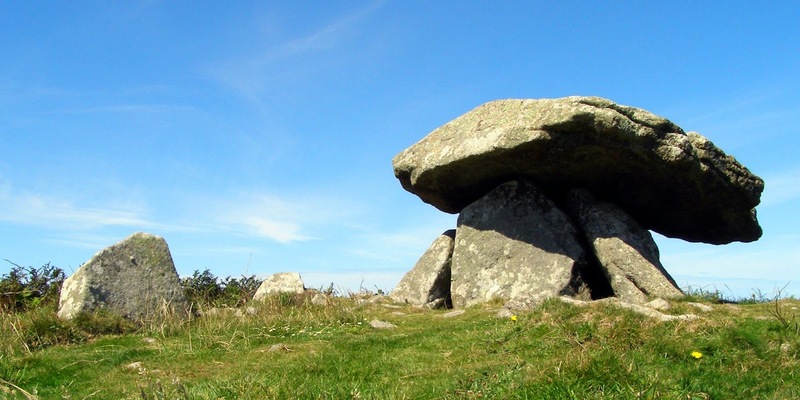 = downs) Castle is an iron-age hill-fort with an obviously defencive design but it is surrounded by much older features including bronze age barrows & the close by Chûn "Quoit" (or Cornish dolmen - see pic. 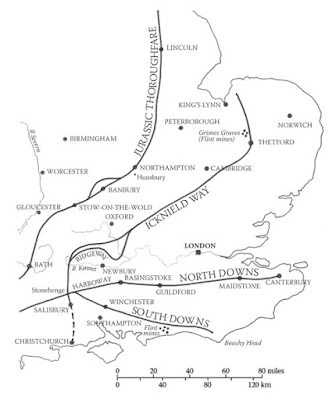 below) which is neolithic dating back to 2400 BC. In fact the castle may have been built around much older tumuli on the hilltop. At the foot of the hill there is the ancient courtyard-house settlement of Bosullow Trehyllys (pron. ; Boz-low Trilleez). Courtyard houses are from the late iron-age/Romano-Brittish era but there are some earlier, simpler round-houses. The ancient track-way down to the settlement from Chûn Castle runs in the direction of the midsummer sunrise so, from the perspective of the settlement, the midwinter sun sets behind the castle. Then the alignment ends up close to a cave at the dramatic cliffs of Lizard Point before heading out to sea. 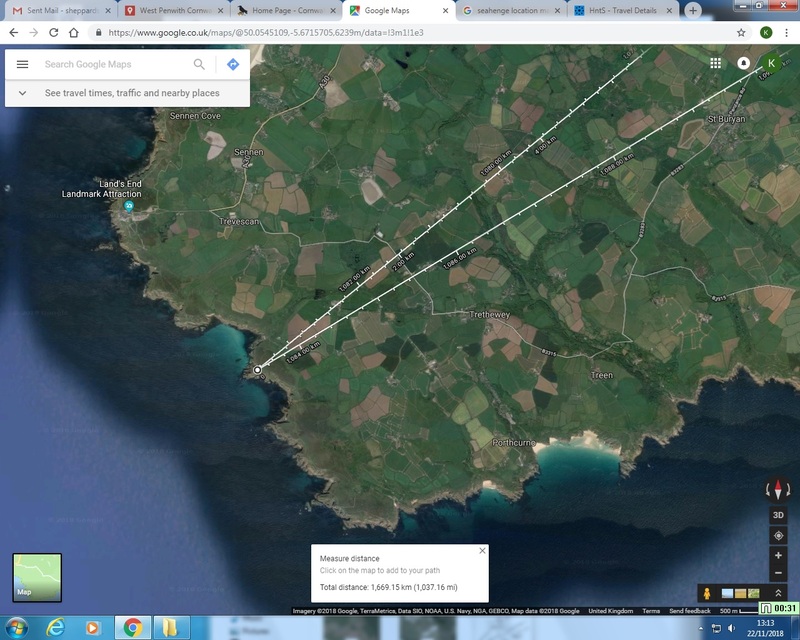 Fans of male/female attributes might have noticed that the line runs across Kynance "Cove" (female; bay, Cove, receiver, entrance, yoni etc.) 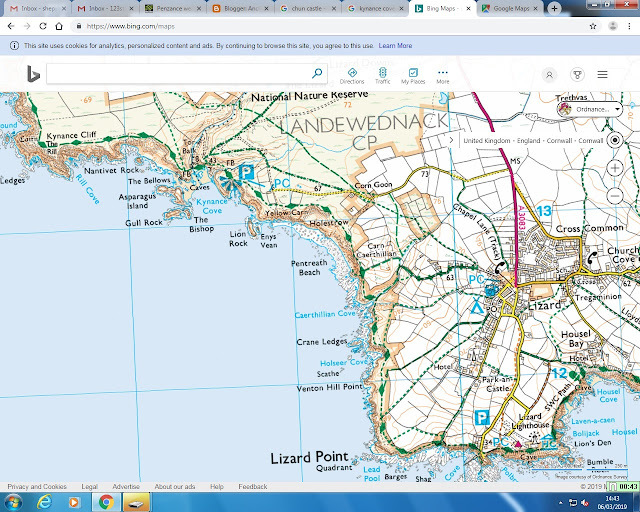 then passes through Lizard "Point" (headland, Obelisk, transmitter, probe lingham etc.) before heading out to sea. 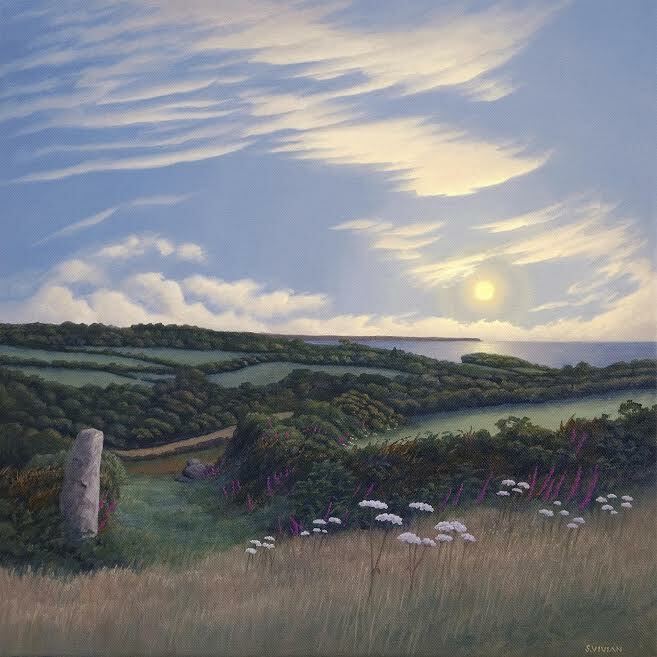 The painting above is called "Lesingey Round From Trewern Round" & is by artist Sarah Vivian ( www.sarahvivian.com). This picture beautifully illustrates the alignment of the last three features on the Drombeg - Lizard alignment that we have just studied. It shows a mid-summer full-moon rising over the mid-winter solstice sunrise position, having just risen near it. The distant headland that the moon is over is Lizard Point, the tree-covered hilltop directly beneath, framed by the sea is Lesingey Round & the foreground is Trewern Round. The point of view of this picture faces straight down our alignment. So back we go to the crossing point of these two alignments, Lesingey Round to continue north-east, further up the Carn Lês Boel - Seahenge line. As this post is already quite long & there are a lot of sites still to mention on this alignment, I will continue in more of a list manner, naming the site, providing satellite images & pictures for illustration but only writing what is necessary or relevant to the alignment. 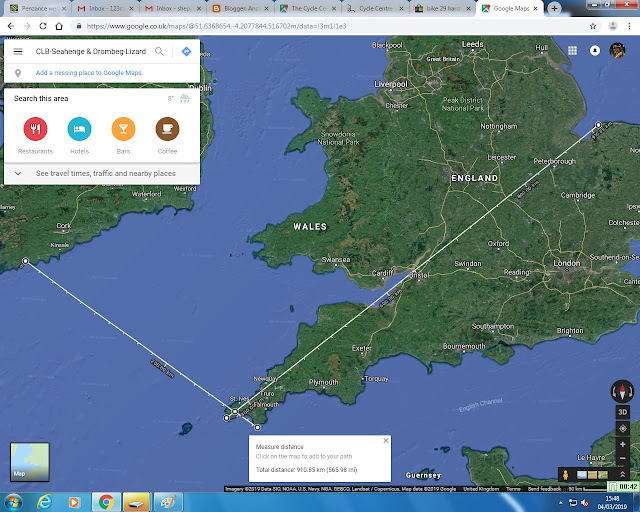 After crossing the Hayle estuary (Cornish heyl = estuary or marsh) & passing close & equidistant between a menhir on Hayle Towans (Cornish; towans = dunes) & the ancient church at Phillack (St. Felicitas), not to mention close to the Bucket of Blood pub near the town of Hayle, our alignment passes through the sites of three Cornish Rounds in a row; Trevarnon Round, Pennance Round & Carlenno Round all near Gwithian & within a mile of each other. 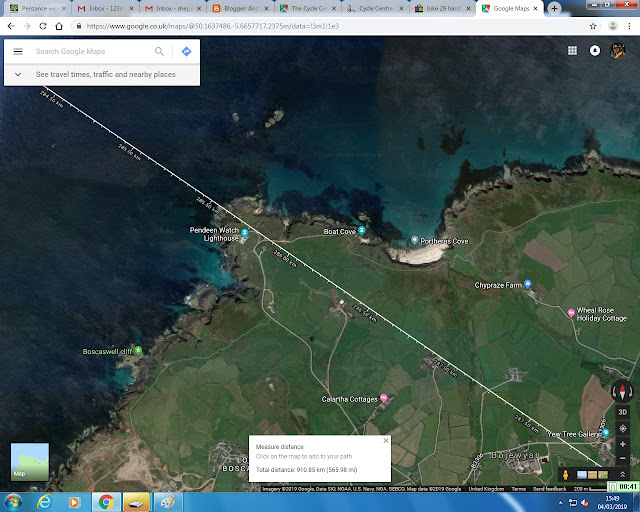 Then just over 2 miles (3.23 km) further, the line runs through the site of Crane Castle, in between Gwithian & Portreath. 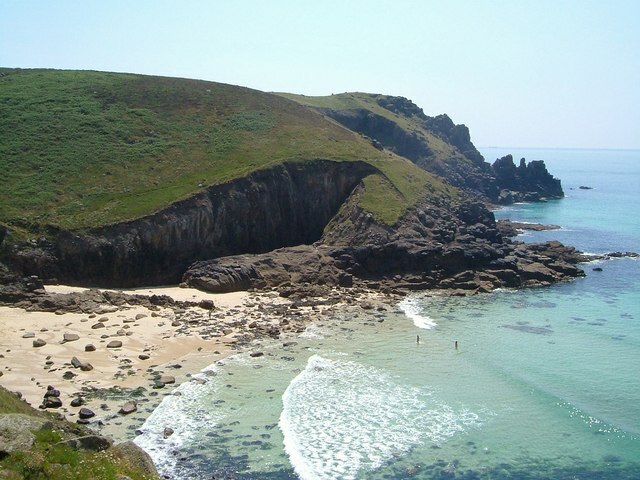 Then passes close to both Tregea Cliff Castle & Nance Hill Castle at Portreath (Cornish; par/porth = cove, treth = beach). Sat. image 18, CLB - Seahenge line - Crane Castle near Portreath, Cornwall. St. Piran's Round, or Perran Round as it is known locally, is one of the best preserved Cornish Rounds or Plen-an-gwary (Cornish = field of play). 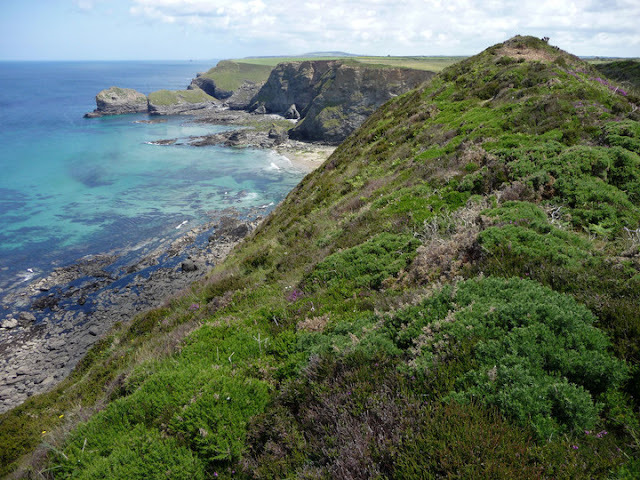 It lies in the hamlet of Rose (Cornish ros = common or heath) near Perranporth. 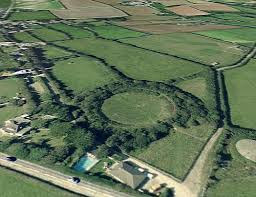 It's age is uncertain but it has been described as typical of an iron-age circular enclosure (or Round) & was certainly used in medieval times for religious plays & sport. The saint to which it is dedicated is probably the most popular saint in Cornwall & deserves a mention here, especially as we are near Perranporth (Cornish;St. Piran's Bay), the coastal location where St. Piran arrived on Cornish shores. 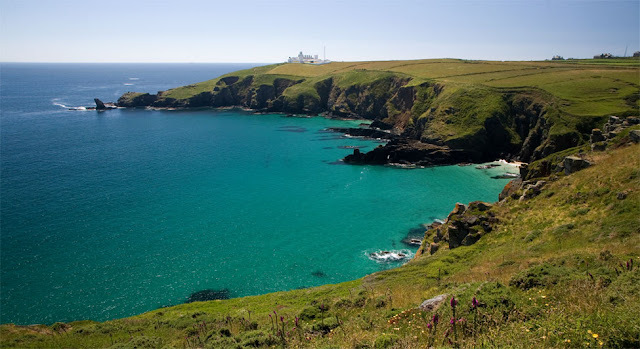 St. Piran (Cornish; Perran) was a 6th century abbot saint who, is credited with, amongst other things, rediscovering tin mining in Cornwall. He is one of the three important saints, of many, in the region along with St. Petroc & St. Michael. He has been identified as the Irish St. Ciarán of Saigir with an adapted pronunciation. Legend has it that the heathens of Ireland tied him to a millstone & rolled him into a turbulent sea. 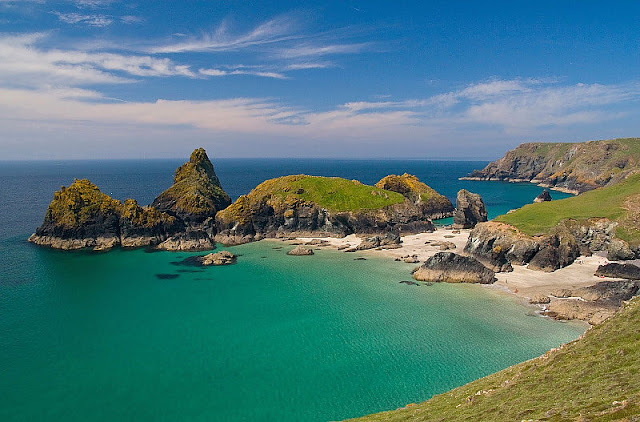 On contact with his holy person the towering waves were said to have become calm & he floated out to sea on his millstone until he had crossed the Irish Sea & landed on the sands of Perranporth in Cornwall. The people of Perranporth (along with other Cornish towns) celebrate St. Piran's day with a holiday on & around the 5th of March including parades, story telling, feasts & entertainment. 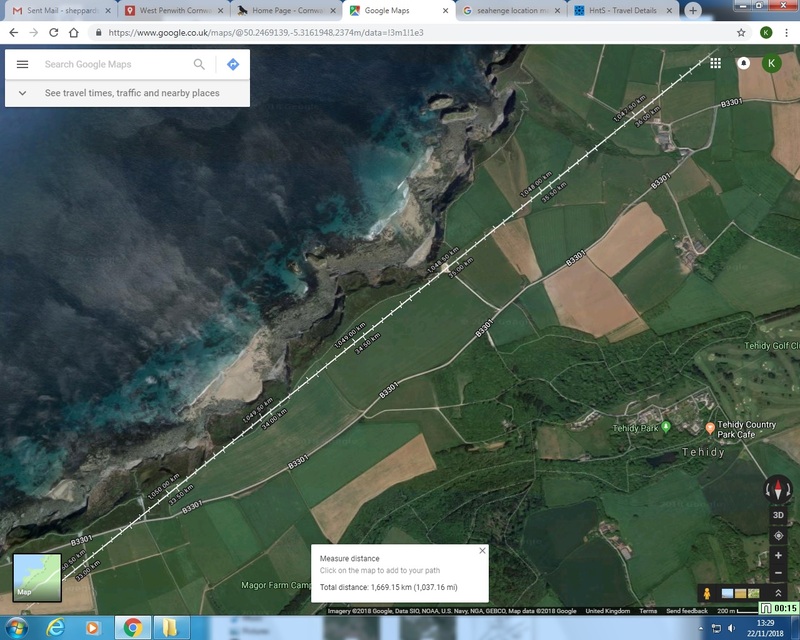 Another 10 miles (16.10 km) up-line we pass close (500 yards [0.457 km]) to the church (St. Columba) at the town of St. Columb Major. Not as close as some features but worth a mention with relevance to my next post. Our next line event takes us 4.5 miles (7.25 km) to St. Breock Downs near Wadebridge. 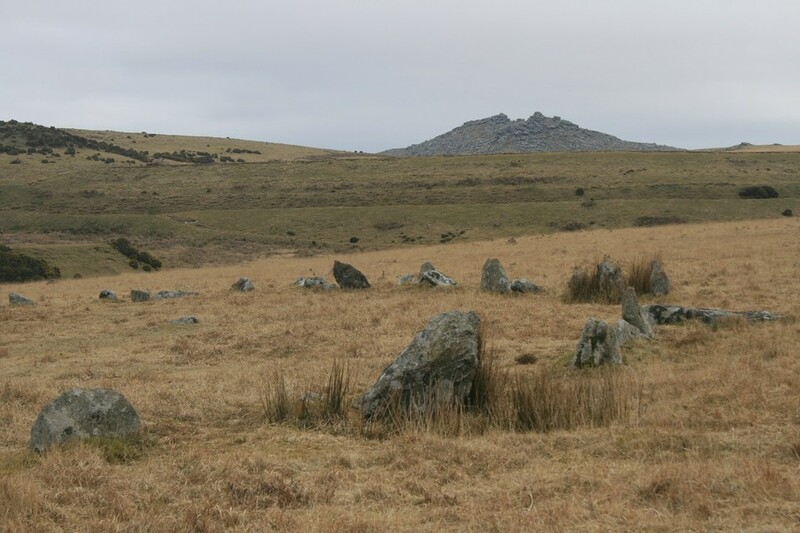 The line passes close to a menhir known as Men Gurta which is just one of many ancient features on Breock Downs including; a stone row, many tumuli, an inscribed stone etc. This is a very large & beautifully marked stone (see pic. 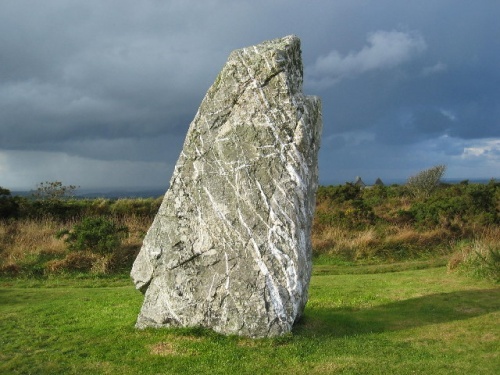 below) It is said to be the biggest menhir in Cornwall - certainly the heaviest & possibly the tallest with the underground portion included but The Blind Fiddler in Penwith (mentioned earlier as a feature on this same alignment) stands half a meter higher above ground. Our line passes close just before crossing the Camel - the river that reaches the sea at Wadebridge that supposedly gave it's name to King Arthur's court "Camelot". 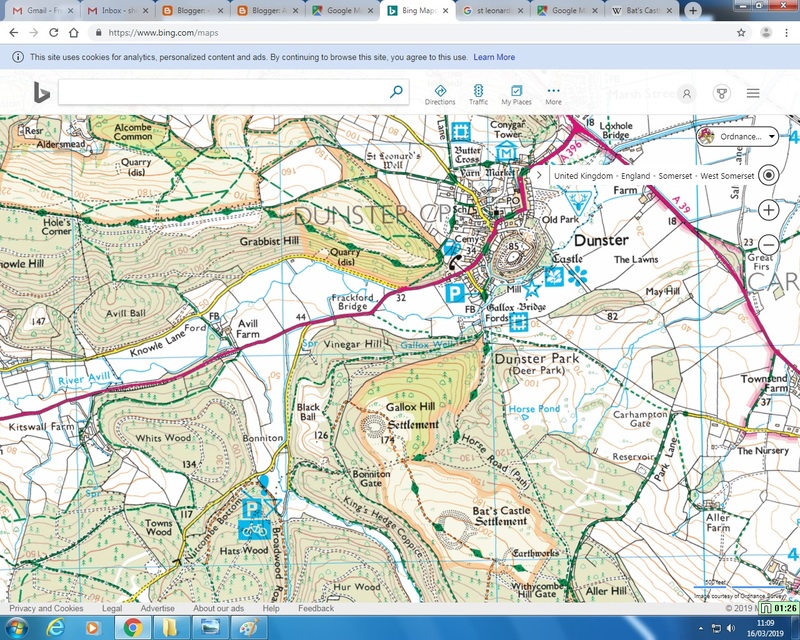 Another 12.17 miles (19.59 km) up the line we find ourselves crossing Bodmin Moor & heading for Stannon stone circle. 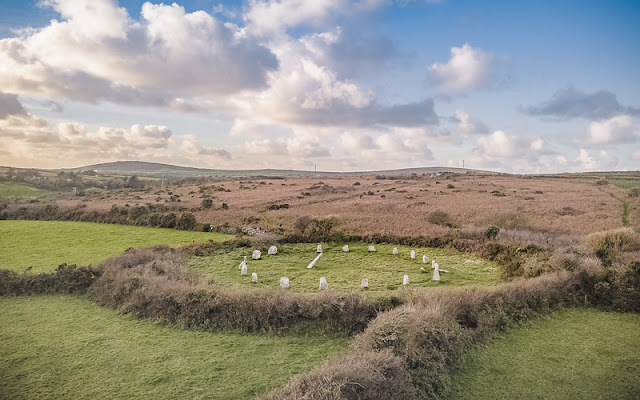 In Penwith, south-west Cornwall, most of the stone circles there are within site of a usually enigmatic looking rocky outcrop; Nine Maidens circle has Carn Galver, Boscawen-ún circle has Creeg Tol, Tregaseal circle has Carn Kenidjack etc. & here on Bodmin Moor in north Cornwall this also seems to be the case. A good example is Stannon stone circle which has the rocky splendour of Rough Tor (local pron; "Rowter") looming in it's midst. 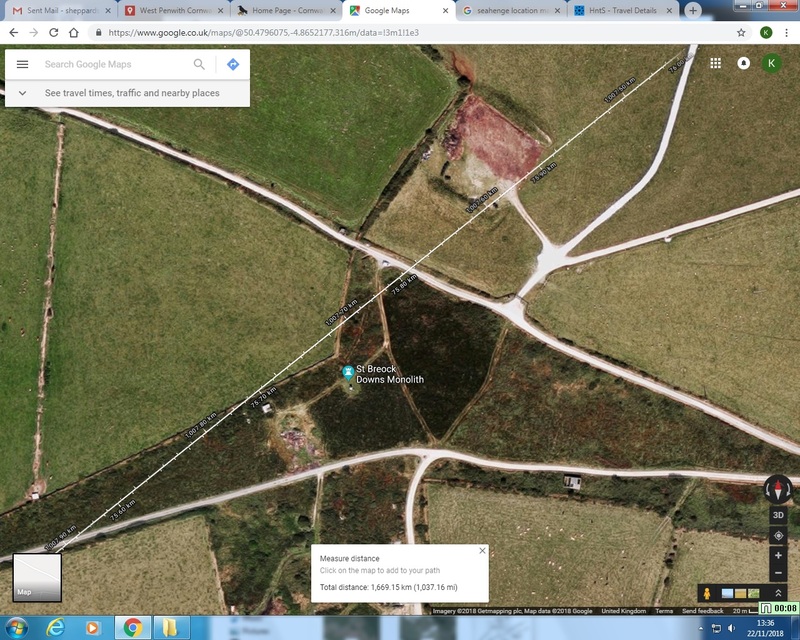 It is not the closest stone circle however, Fernacre Stone Circle is actually on the slopes of Rough Tor but still it's presence cannot be denied at Stannon. After passing the north-west edge of Stannon Stone Circle, the alignment heads for an ancient settlement on the north-west slopes of Rough Tor itself. 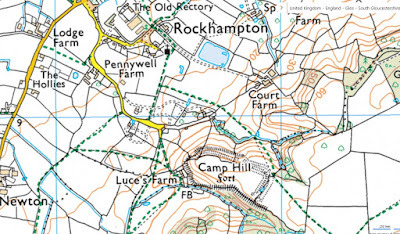 To the south of Rough Tor there is settlement that looks more field-system inclined, but here to the north-west the settlement looks more dwelling orientated (see map below). The Tintagel - Jersey line comes from 310 degrees (50 deg. 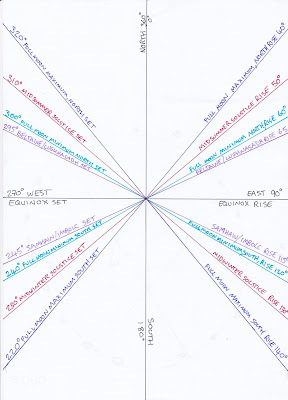 west of north), the geometric direction of the summer solstice sunset, & runs to 130 degrees (50 degrees east of south) which is the direction of the winter solstice sunrise. Because of this it forms a perfect 50 degree geometric solstice cross (100 degree north & south spans) at the settlement. This means that the mid-winter solstice sun would rise behind Rough Tor & set in the direction of Stannon Stone Circle from the perspective of the settlement. 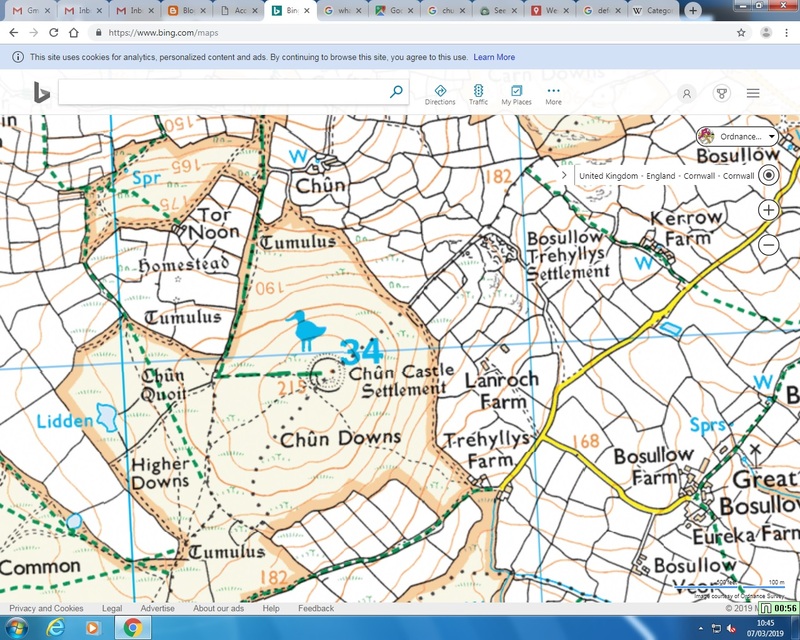 Earlier in this post we saw that the settlement at Bosullow Trhyllys was also in a solstice position in regards to Chûn Castle. 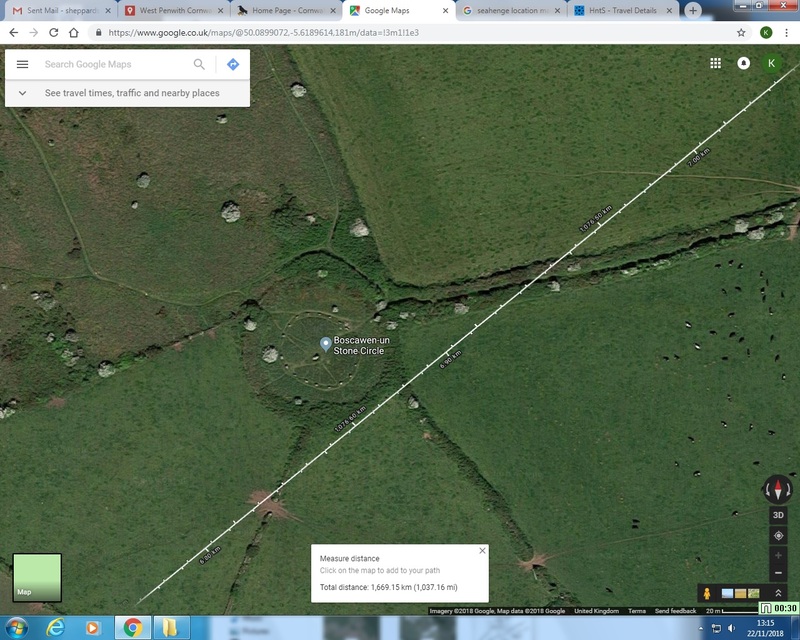 In a previous post (Link; https://ancientwhisperspenwith.blogspot.com/2019/01/the-st-michaelmary-alignment-my.html ) we examined the Tintagel - Jersey line crossing the St. Michael/Mary line between the top two stone circles of The Hurlers near Minions on the other side of Bodmin Moor. 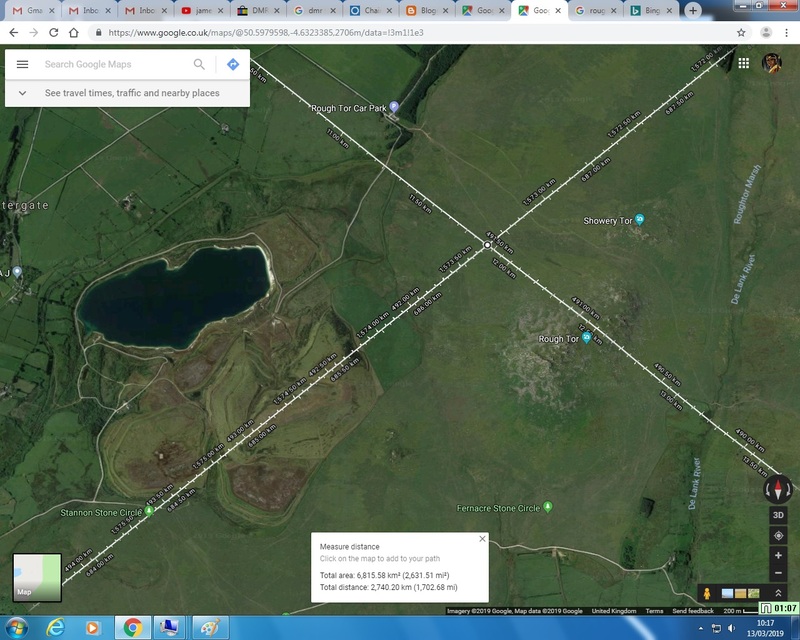 Both crossing points, either side of Bodmin Moor, are shown in the satellite images below. Just 3. 5 miles up the line & still on Bodmin Moor we pass very close to a cross at a place called Sancreed (Cornish; sacred, holy) on Davidstow Moor. 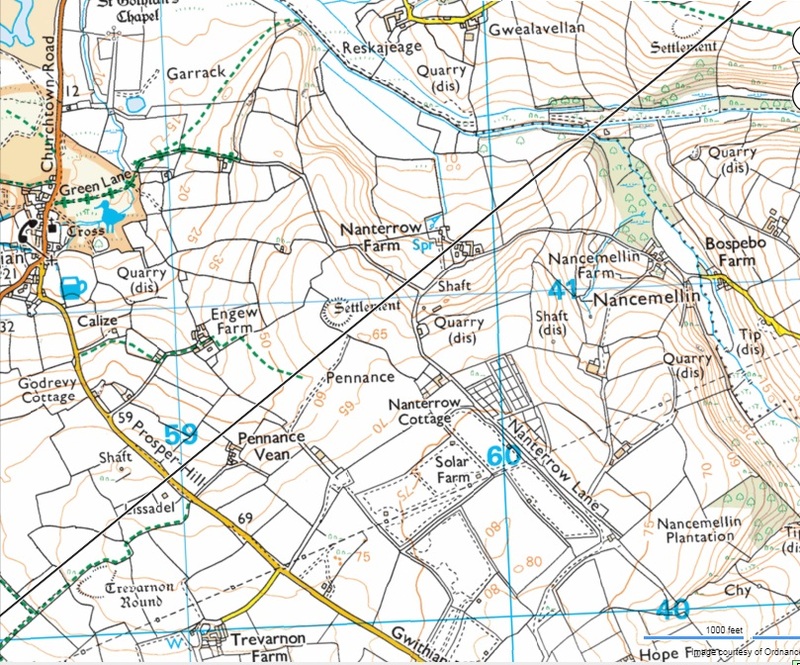 Then right after passes another old cross by an ancient enclosure at Tregulland where the river Inney splits & pools. 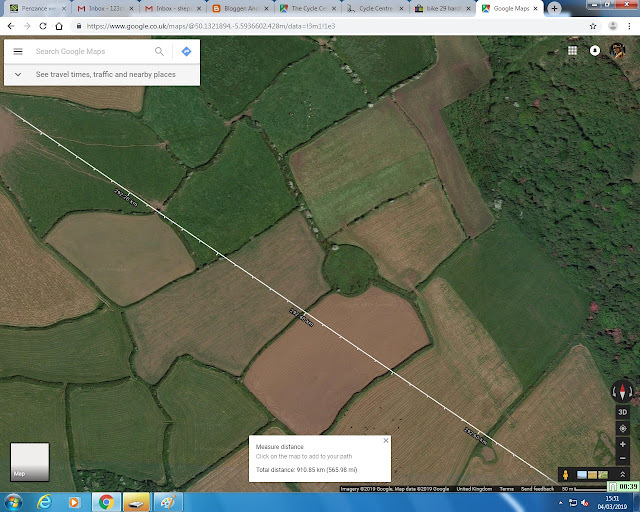 A little further we pass close to Tresmeer church (St. Nicholas) & then pass very close to 2 barrows at Brazzacott. A little further we pass close to two more tumuli at Bradridge farm near Boyton which are the last features of our line within the county of Cornwall as our alignment then crosses the river Tamar which has always been the recognised natural border between Cornwall & the rest of the U.K. (unless the government have anything to do with it!). 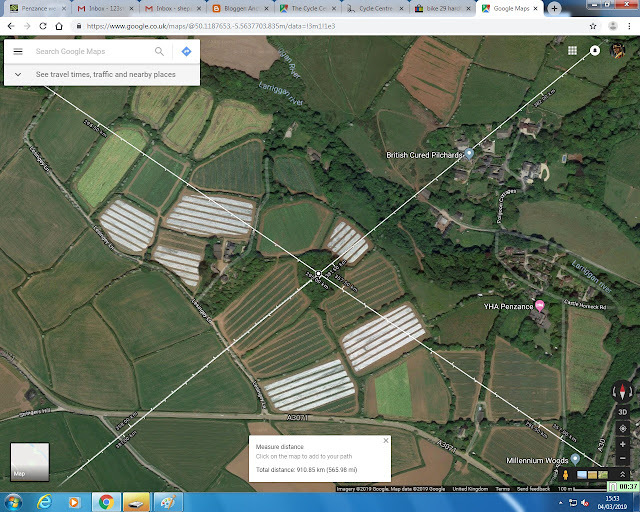 After crossing the Tamar into the county of Devon our line passes close(ish) to the church at Luffincott (St. James) then passes close to first 2 barrows at Swingdon Farm then shortly after, bulls-eying 2 barrows near a well at Burrow Farm, both farms near Buckhorn. 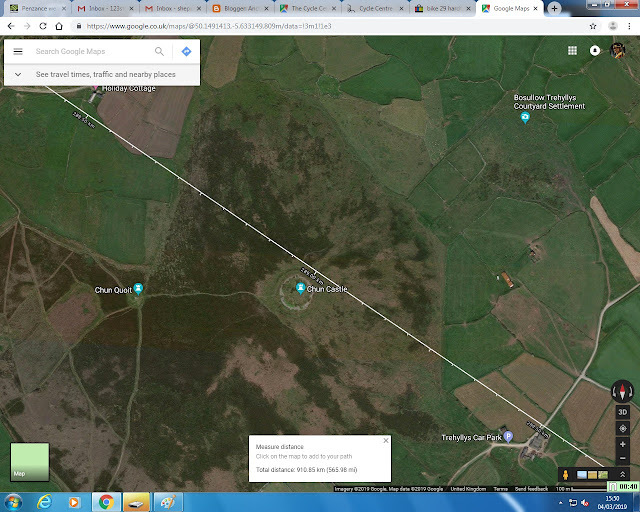 Then 28.6 miles (46.02 km) up-line, on the edge of Exmoor, our line crosses the river Mole & passes next to an iron-age hill-fort at Garliford on Whitechapel Moors near South Molton. 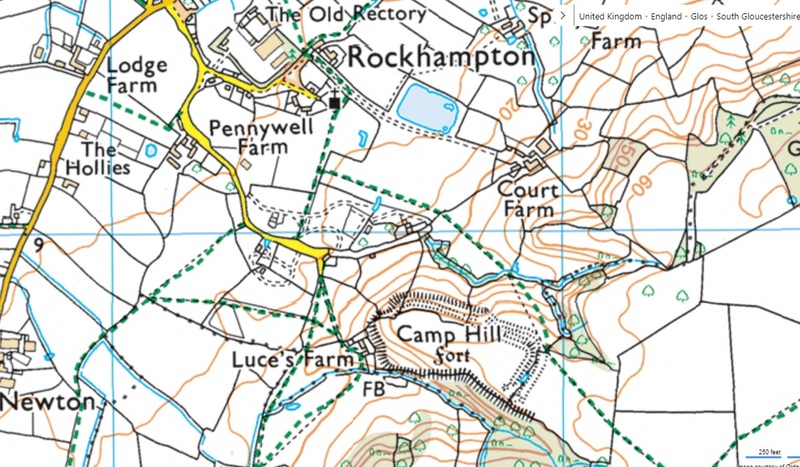 This fort overlooks the river Yeo valley (see satellite image & pic. below). This is the last site before crossing into the county of Somerset. It is interesting to note that after both geometrically crossing the Tintagel - Jersey alignment at significant sites either side of Bodmin Moor, the CLB - Seahenge line crosses Exmoor , passing sites such as Wambarrows tumuli on top of Winsford Hill,when it enters Devon while the St. Michael/Mary line runs through Dartmoor. 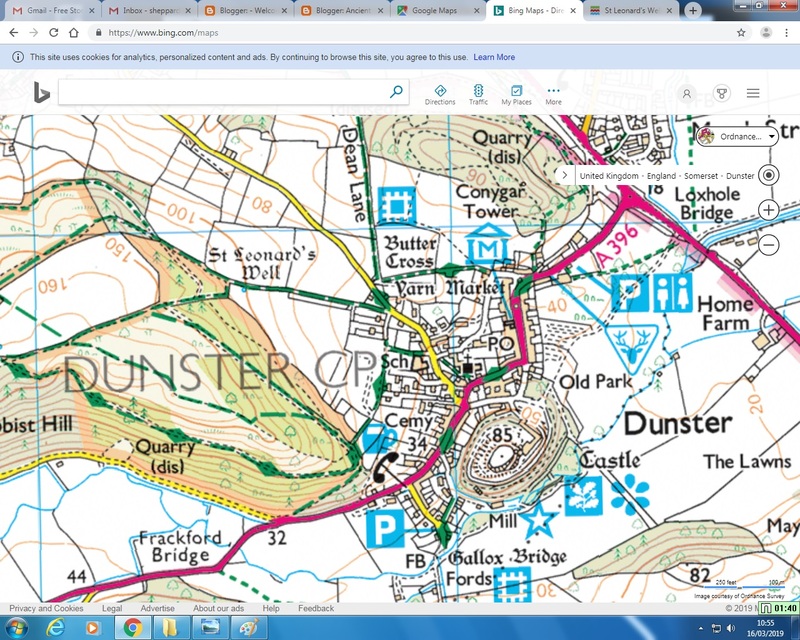 8.4 miles (13.51 km) further on from Wambarrows, just before we reach the town of Dunster, our line passes at the very foot of the hill that houses Bat's Castle - an iron age hill-fort & Gallox Hill settlement (see map below). 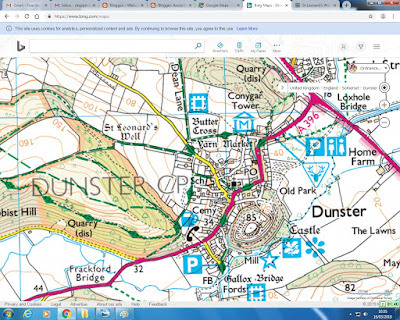 Our line then runs through the town of Dunster itself. It passes Dunster Castle & the parish & priory church of St. George to the south-east & St. Leanord's holy well to the north west (see satellite image & map below) before leaving the shore & heading out into the Bristol Channel. 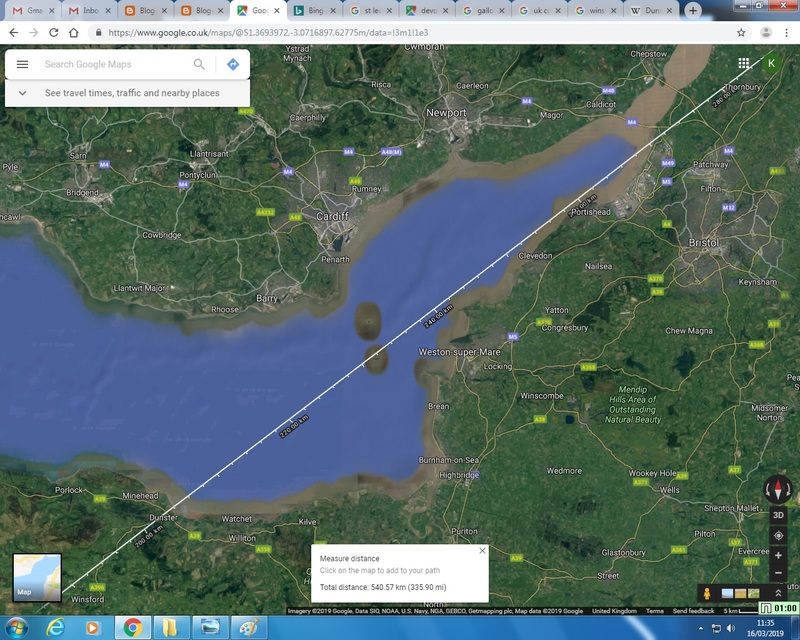 It can be seen in the satellite image above that our line runs along one of two small islands in the Bristol Channel; Steep Holme, the other being Flat Holme. 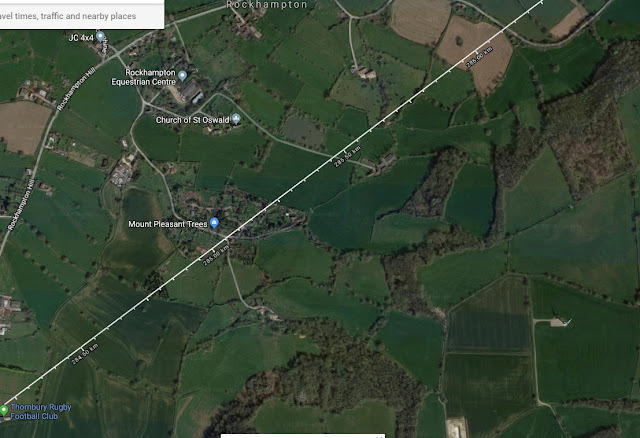 On a recent visit to Brent Knoll hill-fort in Somerset, a site that overlooks the Bristol Channel as well as Steep Holme & Flat Holme islands, I noticed that Glastonbury Tor, visible on the horizon to the south-east seemed to be in line with Brent Knoll & Steep Holme. Later when I checked this line on a computer, I realised that this was another solstice alignment oriented from 306 degrees (54 degrees East of North) to 246 degrees (54 degrees West of South) (see satellite image below).This makes it in the same direction as the Drumbeg - Lizard line discussed near the beginning of this post. 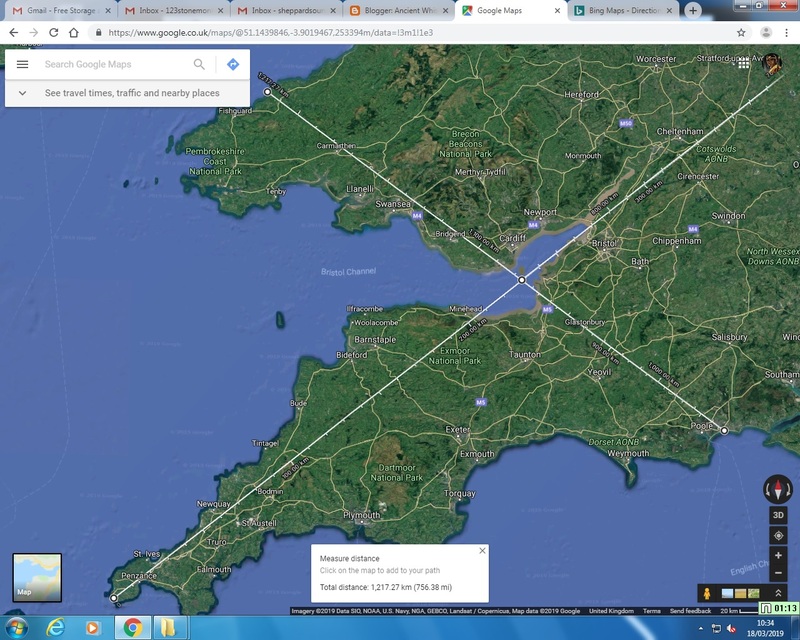 This alignment, like all the others, ran through many other sites & churches such as Glastonbury Tor, Hambledon Hill, Buzbury Rings, Hod Hill & Badbury Rings hill-forts. As this post is already very long, there is no space to examine this alignment here so I plan to include it in my next post. Well sure enough, it turns out that there actually is. 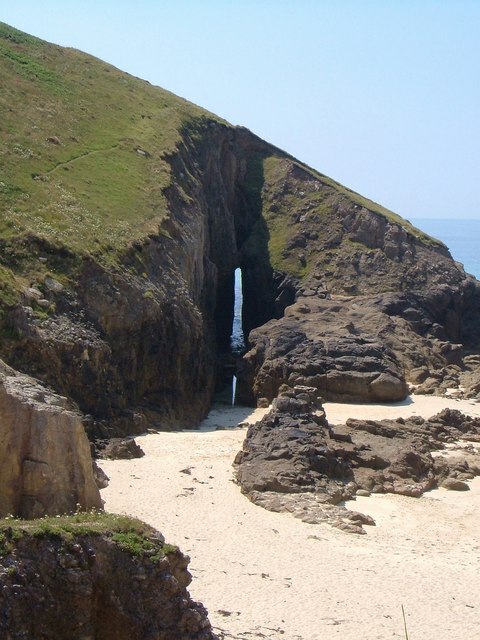 A parallel line runs from a natural arch on the Land's End promontory all the way to The Wash running along the inside edge of Flat Holme & taking in over 60 ancient sites & churches including; Bartinney Castle, Boscence Chapel, Chysauster ancient village, Treringey Round, Haresfield hill-fort, etc. This line will be the main subject of my next post which will be a kind of "part 2" to this current one. 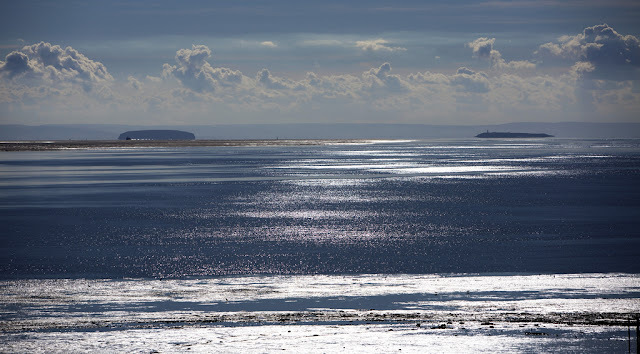 So, for now, we're going to follow the rest of the Carn Lês Boel - Seahenge single alignment from Steep Holme onwards North-East. 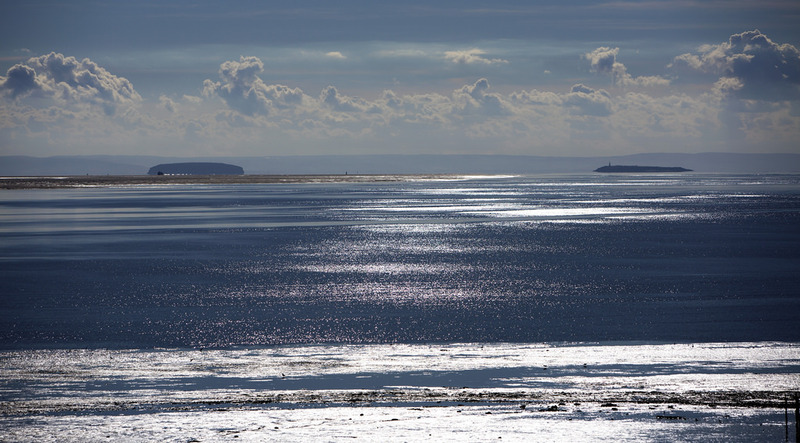 As can be imagined, both Steep Holme & Flat Holme have served as advantageous posts throughout the ages. 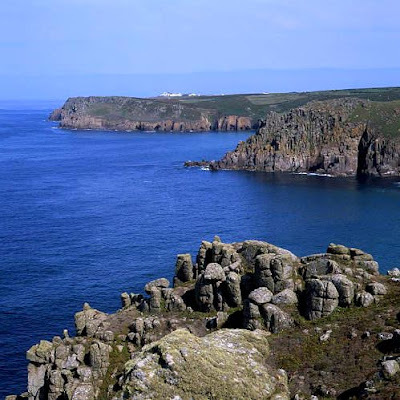 Worked flints have been found dating back to the Mesolithic (middle stone-age) & Neolithic (new stone-age) periods when the island may have been a hill on the mainland or promontory. 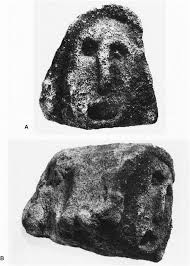 It was thought to house a Roman watch station & a carved head was found there thought to be Celtic from Romano-Britain or late Iron-age times. Also some Roman "luxury items" have been found there. 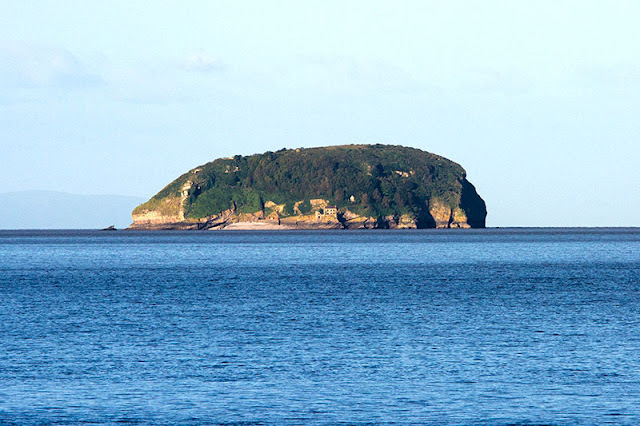 In legend Saint Dubricus, the saint said to have crowned King Arthur lived as a hermit on "Stepeholm" an island in the River Severn. 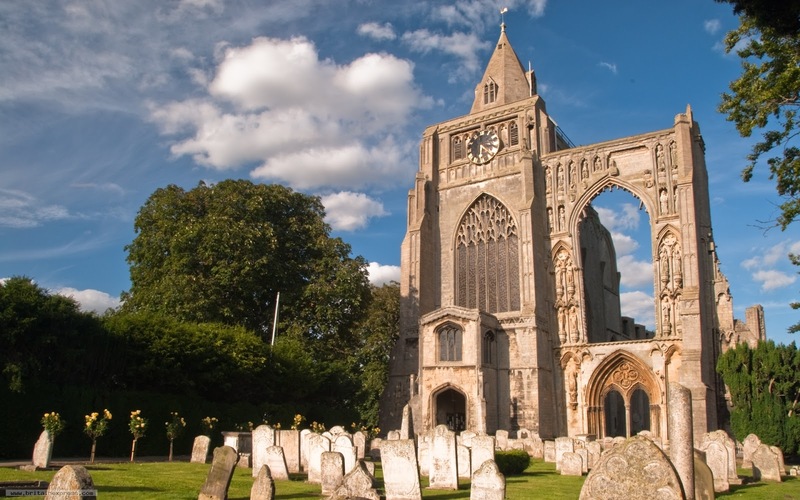 The Vikings used the island as a base for the pillaging of the mainland & in 1150 an Augustinian priory dedicated to St. Michael was established there. 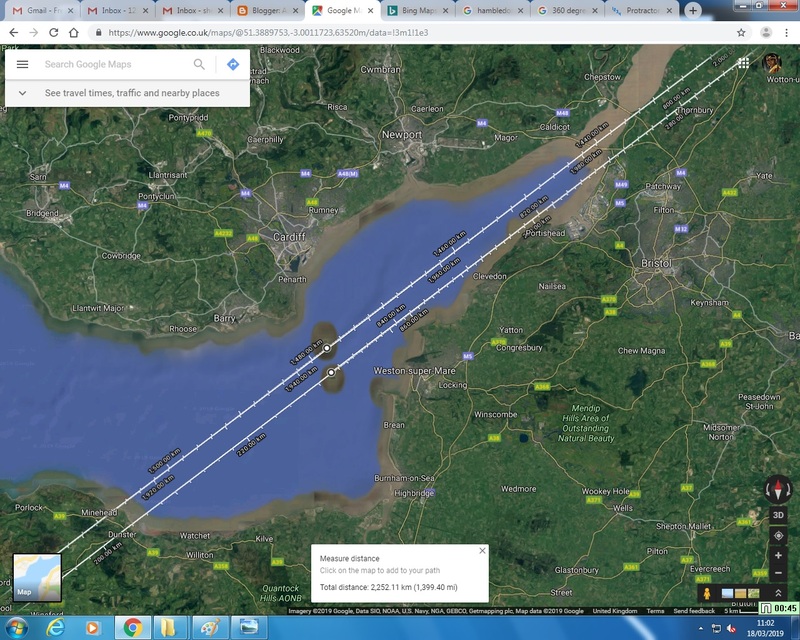 When the line runs by Steep Holm it is effectively hitting the mouth of the River Severn. Shortly after it runs across the mouth of the River Avon. 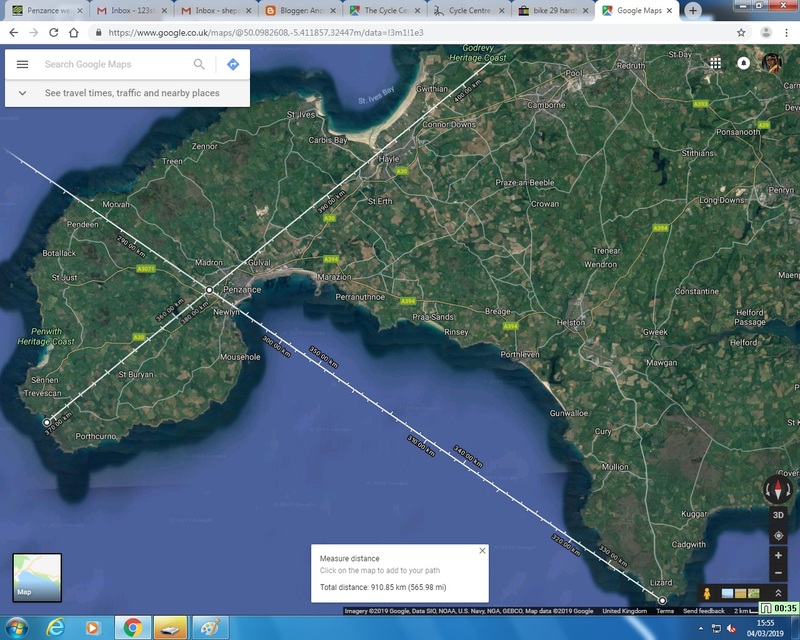 As has been shown in previous posts (https://ancientwhisperspenwith.blogspot.com/2019/01/the-st-michaelmary-alignment-my.html & https://ancientwhisperspenwith.blogspot.com/2019/02/the-st-michael-triangle-duke-line.html) that major river mouths seem to fall on alignments just like hills & islands etc. After passing close to the city/county of Bristol, the alignment comes ashore again at the Gloucestershire end of the Severn Bridge & heads for The Cotswolds. 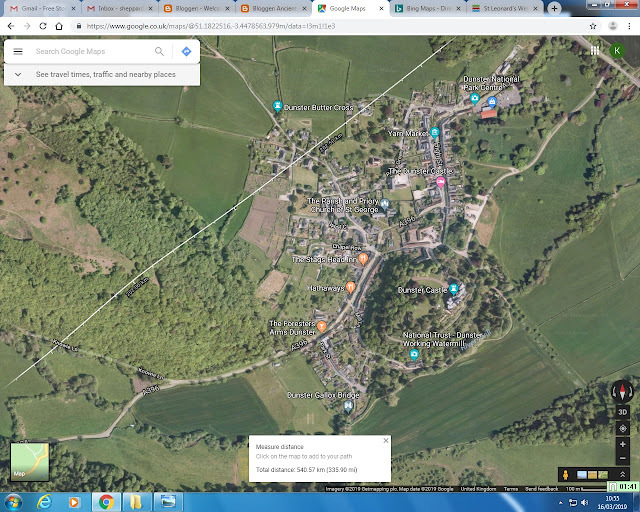 20 miles later, after brushing the market town of Stroud & as the line passes the city of Gloucester, it passes close to two barrows near Brimpsfield before passing close to Brimpsfield (Norman) Castle & Church (St. Michael & all Angels). 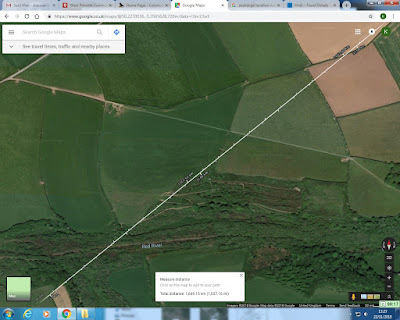 Shortly after we pass very close to a long-barrow near Coberley before bulls-eyeing Coberley Church (St. Giles) then also bulls-eyeing the site of the Medieval Village of Coberley. Then we pass very close to a mound on the top of a hill near Chatcomb Wood. The line also bulls-eyes the site of Andoversford Roman Settlement 3.3 miles (5.31 km) further & yet another 3 miles (4.82 km) it runs alongside Hawling church (St. Edward) & Medieval Village before running very close to a barrow in a field on the other side of the valley. Another 6 miles (9.65 km) the alignment passes close to a long-barrow near Condicote which is a village that has remains of an ancient henge & just another 1.8 miles (2.90 km) it passes equidistant between 2 barrows near Sezincote Estate near Bourton-on-the-Hill. 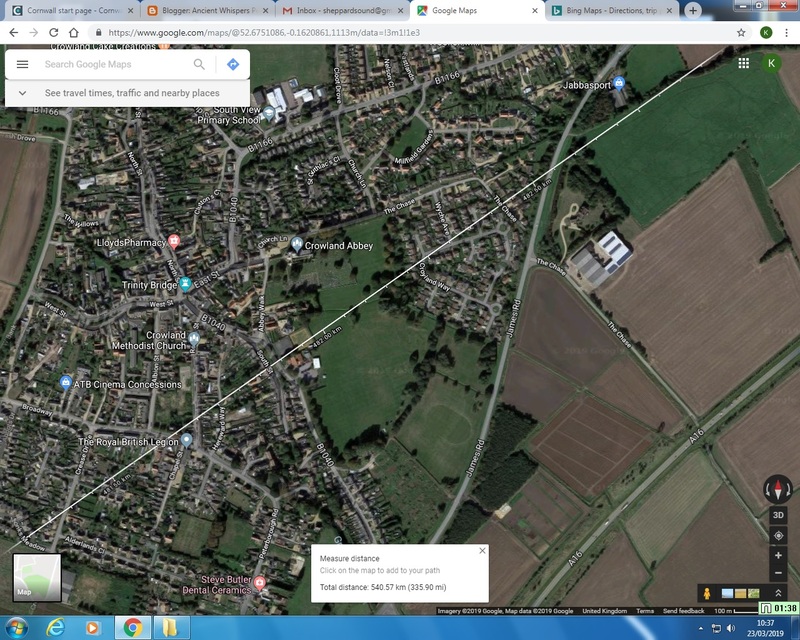 Shortly after our line passes three settlements in close concession, the first on the north-west shoulder of Moreton-in-Marsh which was the original Saxon origin of the market town, then just 690 meters (2263.78 ft) away we run right through the site of a Roman settlement near Dorn before passing the church (St. Leanord) in the ancient village of Lower Lemington & the site of the Medieval Village of Upper Lemington (See satellite image & map below). After Moreton-in-Marsh our line passes from Gloucestershire into Warwickshire & immediately bulls-eyes the churches in the next 2 villages; Todenham (St. Thomas-a-Becket) & Burmington (St. Barnabas & St. Nicholas) before passing over the north-west slopes of Brailes Hill, the second highest point in Warwickshire & castle site. 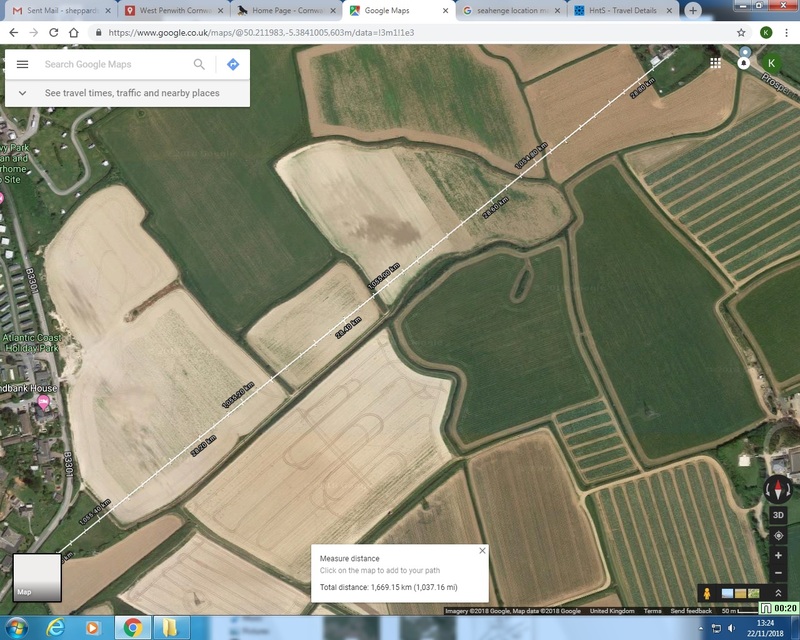 After a sparse number of events on the line through Warwickshire we pass into Northamptonshire to the village of Badby, 20 miles (32.18 km) from our last site, where the alignment comes very close to a barrow north of the village. Then just 1.5 miles (2.42 km) away we reach the south-west point of the market town of Daventry, an area that seems to contain many ancient features. 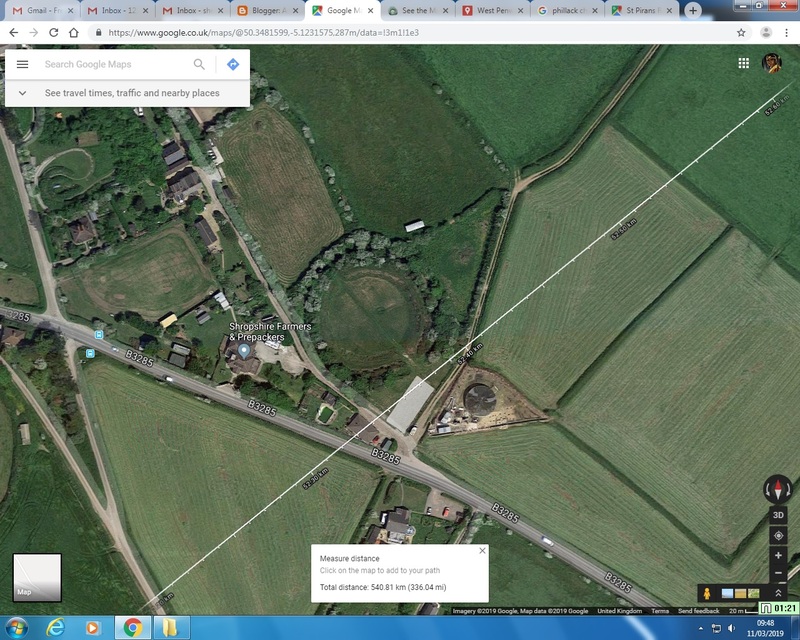 Firstly a site known as John of Gaunt's Castle, only it's "Moat" is marked on the map (below) near a hotel. 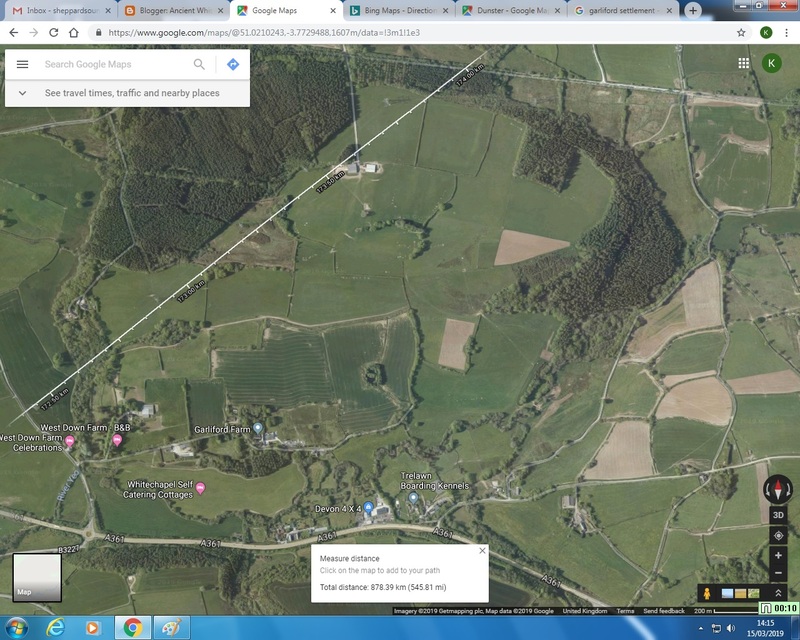 The remains are hardly likely to be that of a castle but perhaps a hunting manor as the area was an extensive deer park from the late 13th to the early 16th century. 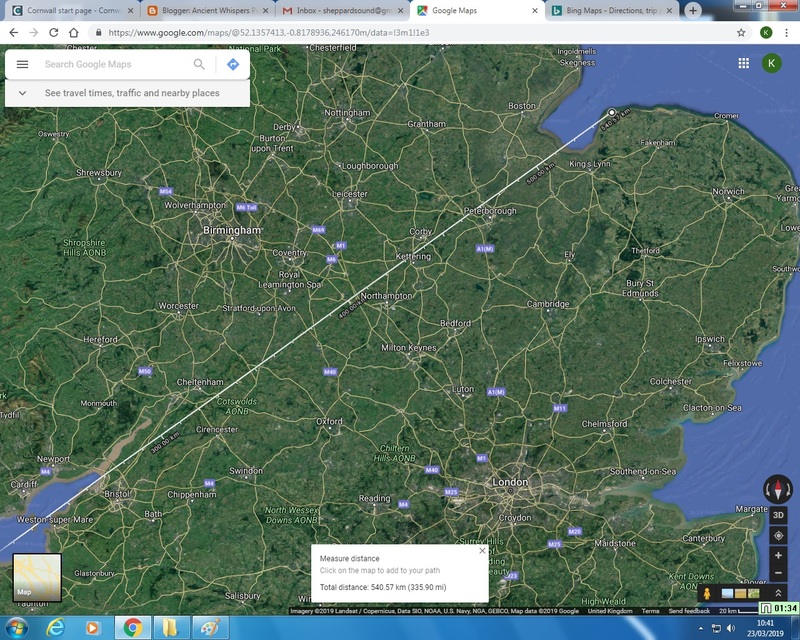 - Unconnected but interesting aside; John of Gaunt was the 14 century Plantagenet Duke of Leicester who is the ancestor of both US President Donald Trump & Hillary Clinton. Most US Presidents have traceable blood connections to British royalty. Just 500 meters away is the site of Burnt Walls. Burnt Walls consists of the remains of an Iron-Age fort that may also have been used for a medieval fortification or a hunting lodge for the nearby John of Gaunt's Castle. Burnt Walls is at the foot of the south point of Borough Hill & our alignment climbs almost to the top as it passes over the South-East corner. 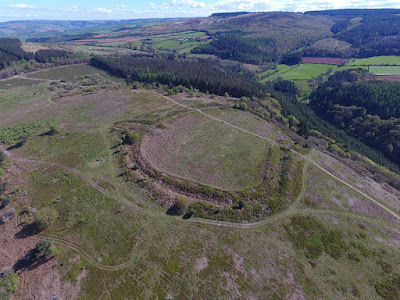 Borough Hill is the site of two Iron-age forts, one said to be one of the largest in the country, but remains of activity have been found from as early as the Neolithic era. 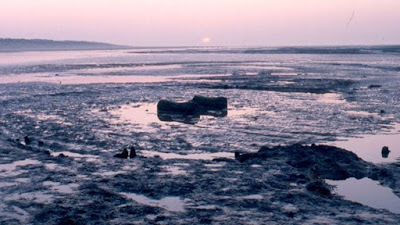 Also two Bronze-age barrows, a Roman villa & evidence from the Saxon & Viking periods. We continue through Northamptonshire as our line runs very close to Lamport church (all Saints), Loddington church (St. Leonard), Woodnewton church (St. Mary) & Yarwell church (St. Mary Magdalene). As our line clips the South-East corner of Lincolnshire it passes very close to the remains of the Benedictine Abbey (St. Mary the Virgin, St. Bartholomew & St. Guthlac) in the small town of Crowland (or Croyland), north-east of Peterborough, a monastic community having been established in the 8th century after St. Guthlac arrived there in the 6th century when the area was an island in the Fens. It has been shown in previous posts how alignments can bulls-eye islands (among other natural features) & here it hits an island from the past, quite like Glastonbury. For "coincidence" event fans, once offshore the line runs very close to a circular artificial island known as the Outer Trial Bank (as can be seen in the satellite image below) which was constructed in the mid seventies as part of an abandoned scheme to build a "tidal barrage" across half of The Wash for the government water resources programme. These lines do seem to like circular constructions! 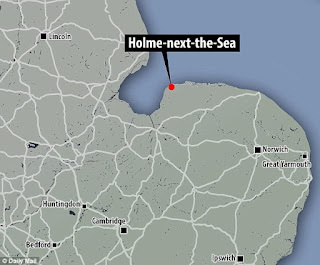 This is not the last we see of the mainland as our alignment comes ashore again to clip the bottom lip of The Wash near Holme-next-the-Sea in Norfolk. As mentioned at the beginning of this post, this is the spot where a series of ancient track-ways (the Ridgeway, the Iknield Way & the Peddars Way) hits the East coast. 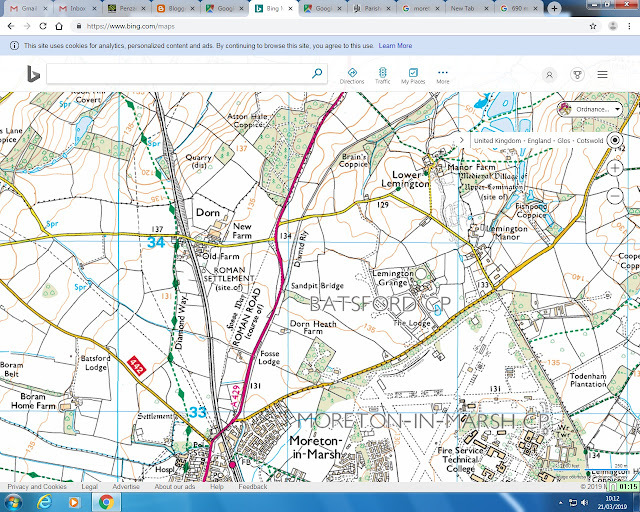 The Peddars Way is a probable continuation of the Ikneild Way from it's terminus at Knettishall Heath near Thetford, Norkolk. 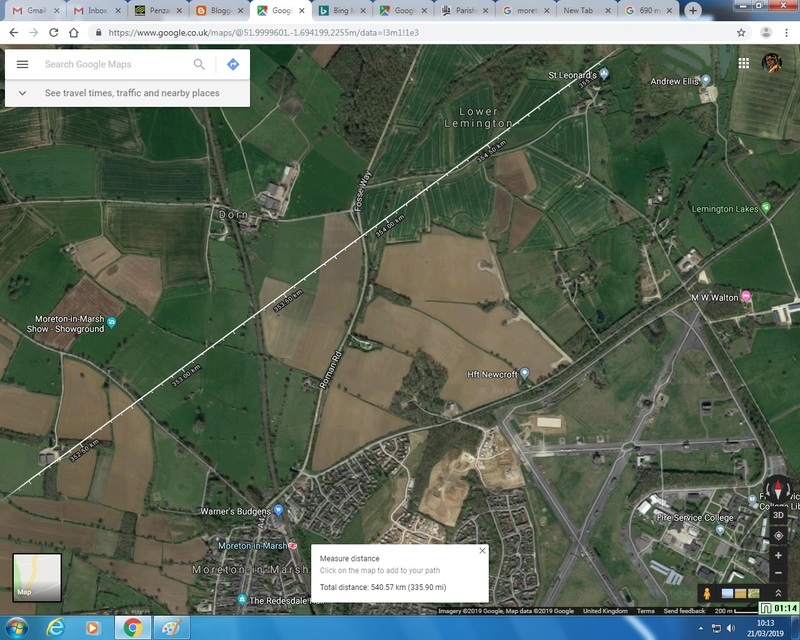 The Iknield Way continues from the Ridgeway terminus from the coast of the county of Dorset in the South-West & joining the Peddar's Way at Knettishall Heath near Thetford, Norkolk. 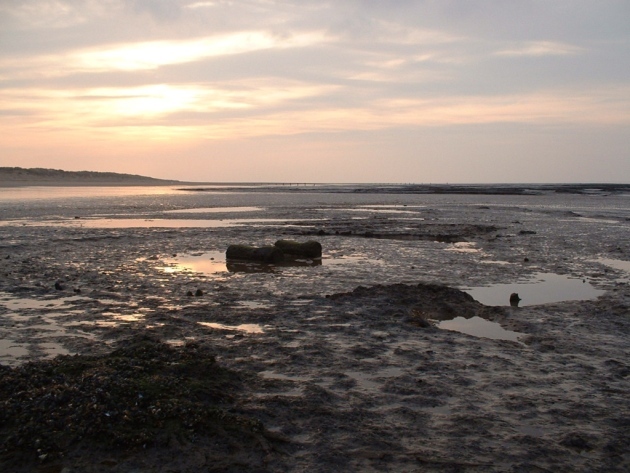 enters the sea, probably continuing across a drier Wash in ancient times. 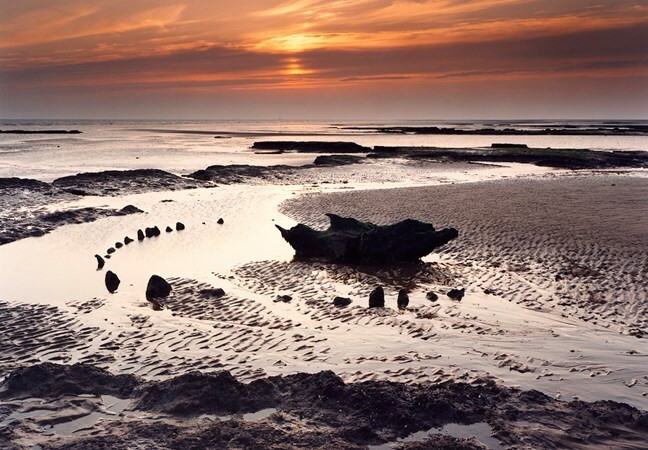 Also, of course, our final destination & the site of Seahenge where two ancient timber circles were found in the nineties. 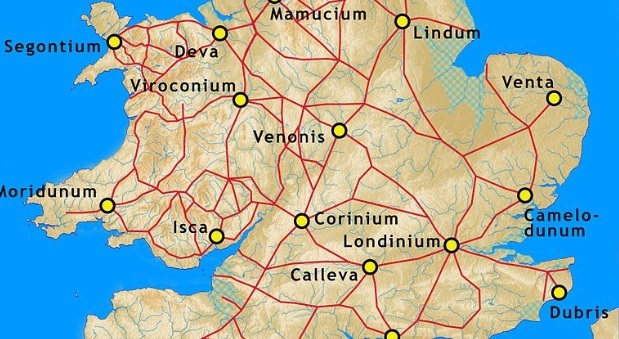 Map 14, series of ancient track-ways ranging from the Dorset coast to the site of "Seahenge"
Also, as shown on the map below, this was a spot marking the end of a major Roman road. Both ancient track-way & road probably continued across the Wash. The first early bronze-age timber circle ("Holme I") to be discovered in Holme-next-the-Sea in Norfolk in1998 consisted of 55 small split Oak trunks surrounding an upturned stump. 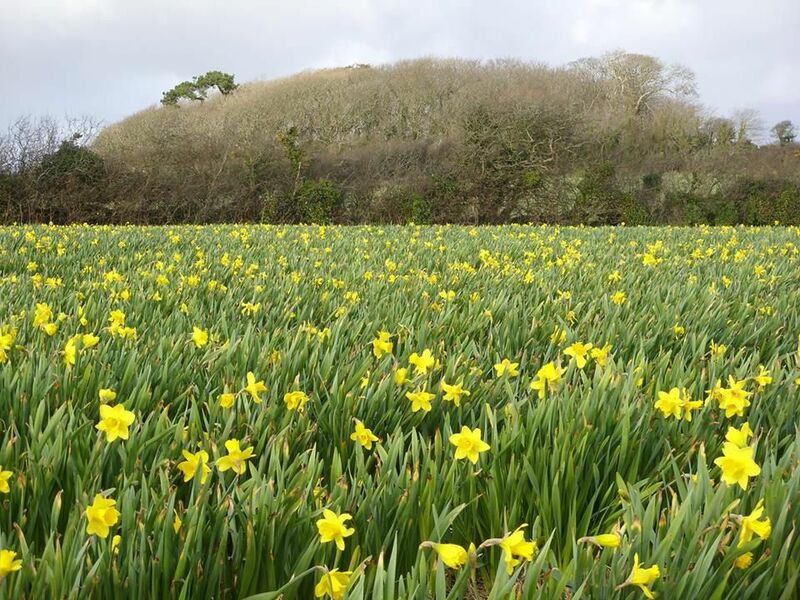 Tests have proved that all the trees were felled in the same summer & marks show that at least 50 bronze axes were used, proving industrious use of bronze when it had only been known for about a century However, the bronze axes would have simply replaced flint & copper axes used for the same function. 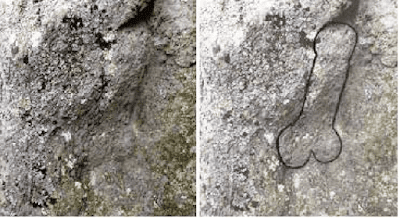 The axe marks are among the very earliest in Britain. 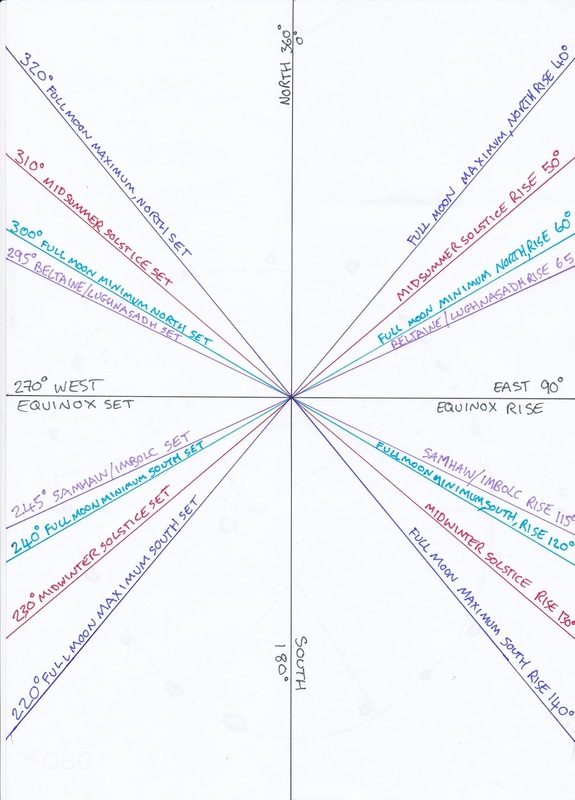 The circle seemed to have an entrance to the South-West which could correspond with our alignment (see plan below). 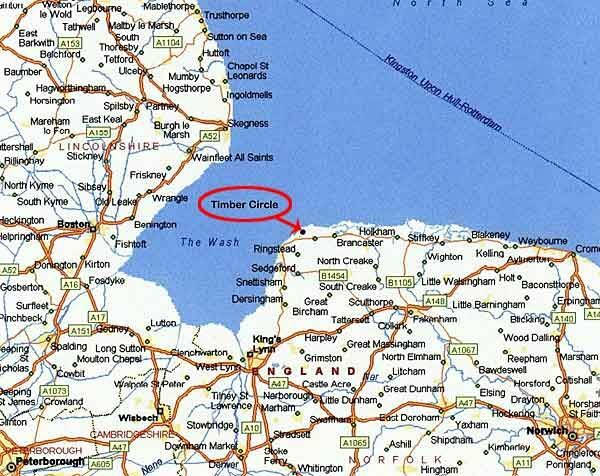 Pic.41, Holme II, second timber circle found. 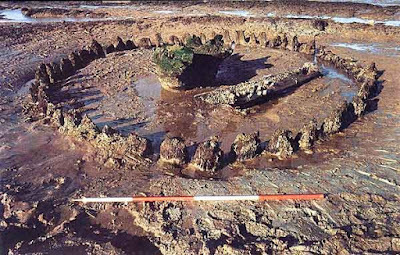 The second timber circle was discovered soon after the first in 1998 & later dating proves that the timbers were again felled in the same early summer. 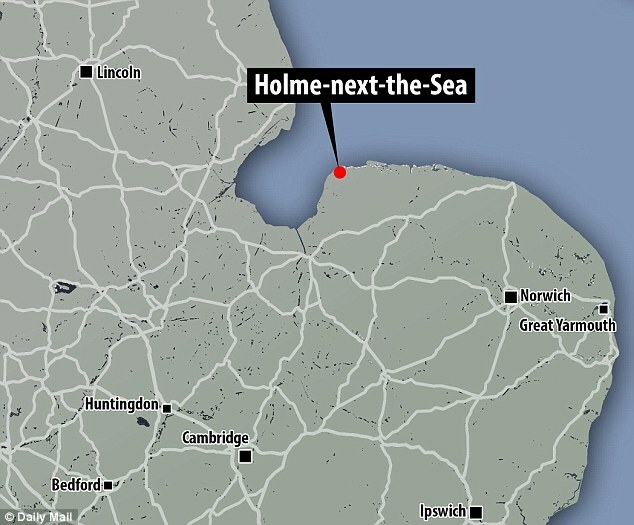 It was unearthed about 100 meters (328 ft) east of the Holme I circle & like the first was dated to around 2049 BC. 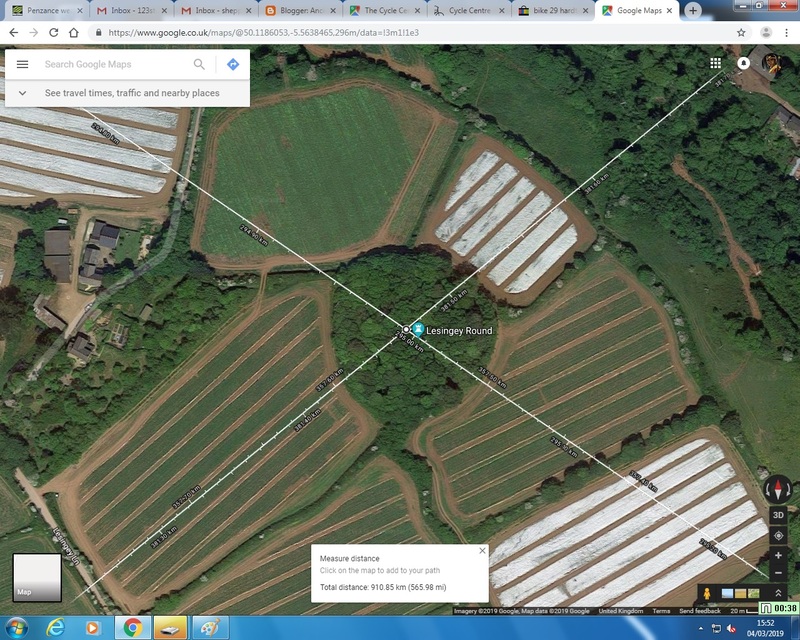 It consisted of 2 parallel, horizontal logs surrounded by an oval of stakes that were interwoven with branches, surrounding this was a semi-circle of stakes set at intervals, surrounded by a tight palisade of split oak posts. Interestingly on both timber circles the split (flat) side of the posts faced inward with the natural side facing out. 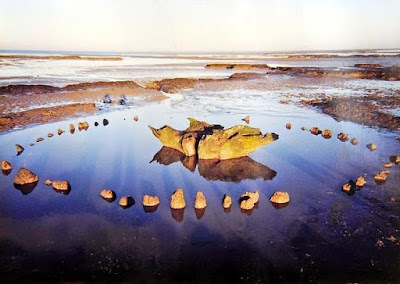 The stones that comprise stone circles are very often dressed on the inside & left natural on the outside. Plan 2, Holme II timber circle, "Seahenge"
As stated earlier in this post, my next post will examine an alignment that runs parallel to this one at about 1.5 miles (2.414 KM) distance. 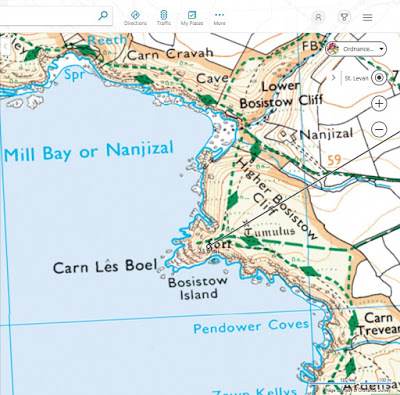 It starts at the Lands End headland & includes features such as; Maen Castle, Bartinney Castle, Chysauster ancient village, Trewern Round , St. Piran's Oratory, Helsbury Castle, Flat Holme island - Bristol Channel, the Toot fort - Oldbury, Hernes Barrow, Haresfield hill-fort, the Devils Chimney settlement etc. etc. etc. I live in Penwith, Cornwall, UK; not only an area of great beauty but a place with a high density of ancient monuments & sites. I have taken great pleasure in visiting many ancient sites over the years, both local & up country & have been drawn into an interest, on discovery, of their alignments & geometry. I definitely do not have a mathematical brain & have found the subjects of geometry etc. impenetrably overwhelming in the past so am very surprised by this turn of events but as I study I find evidence of systems employed in those distant times - these are the "Ancient Whispers" that I experience.